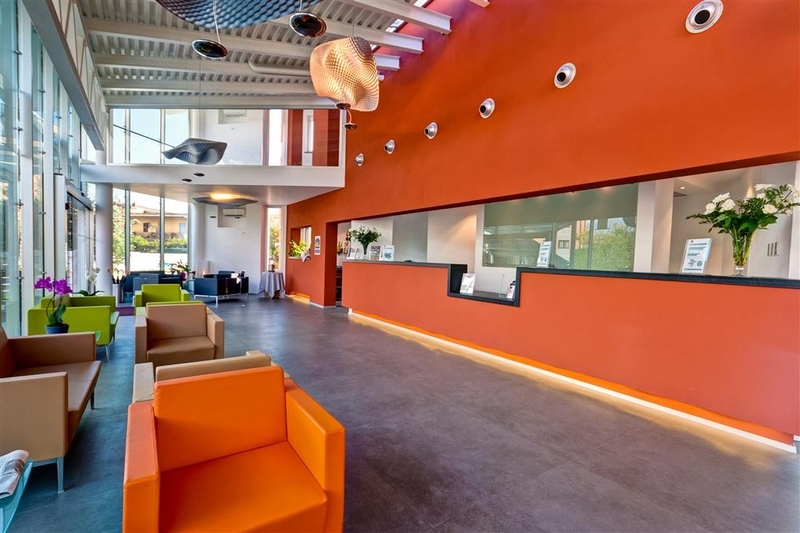 The Best Western Hotel Rome Airport is ideally located in the center of Fiumicino. Come and experience our hotel near the major tourist attractions. Best price guaranteed and exclusive deals. 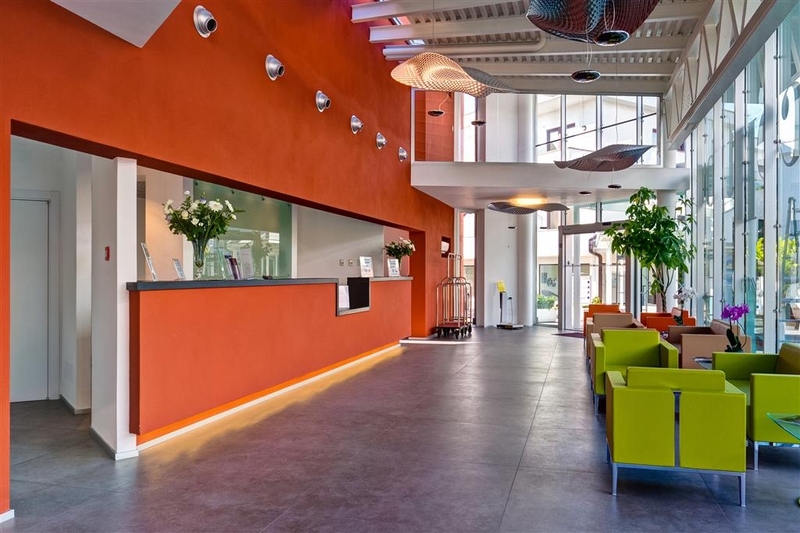 Functional and well-appointed, the Best Western® Hotel Rome Airport is a modern 4 Star hotel situated very close to the main airport of Rome, the Leonardo da Vinci International Airport at Fiumicini. It is a truly strategic location for anyone stopping at the capitol during a business trip. The hotel's shuttle service is particularly convenient to and from the airport, and so are the meeting rooms with the capacity and equipment necessary to meet the needs of even the most sophisticated clients. 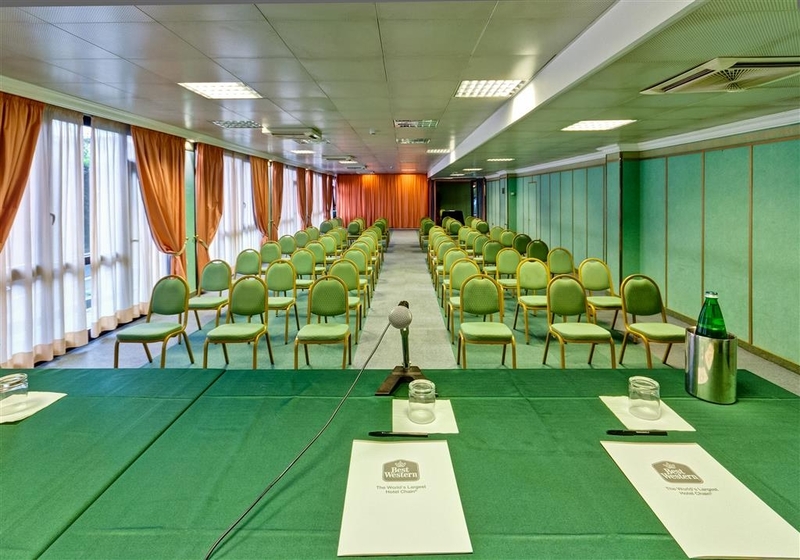 For work meetings that go on for the whole day, the hotel offers its own catering for coffee breaks and buffet service and has an excellent restaurant with menus selected by the organizers offering traditional Roman and Lazio fish dishes with excellent wines from the cellar. For those traveling by car there is ample free private parking available which makes arriving and departing from the hotel that much easier. A convenient elevator takes clients to their floors, even those clients with different disabilities who have rooms especially equipped for them. The pleasant and cordial atmosphere offered by a staff with more than 20 years of experience in the hotel business, rooms that are welcoming, as well as a great cuisine, all contribute to making the Best Western® Hotel Rome Airport the ideal place to stay during a tourist visit. 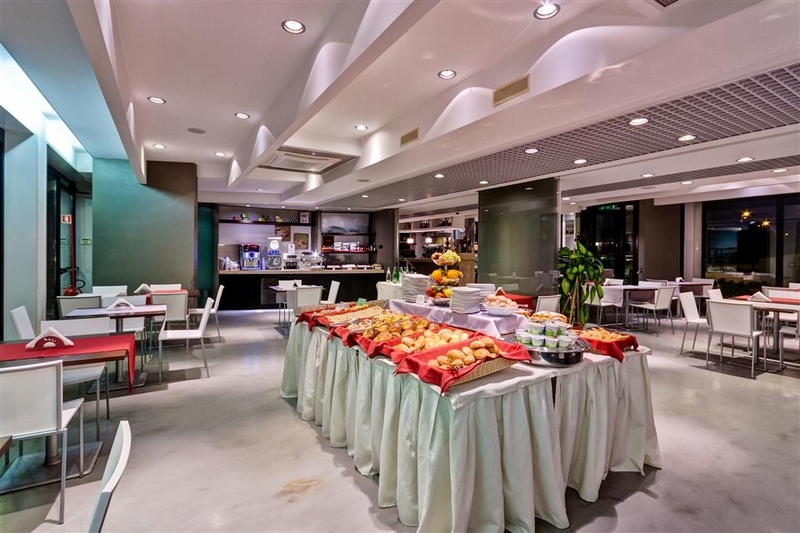 All areas are welcoming, starting from the reception (check-in 24 hours a day), to the large and bright television and reading rooms, the bar, which remains open all day long, the restaurant, and the breakfast room, where typical Italian cafeteria breakfast and buffets are served. Where not included in the rate, breakfast can be purchased at the hotel, at 7 EUR per person, per day. City fee excluded (3 EUR per night, per adult over 10 years old) and 10% VAT included. This hotel was a quick decision for a place to stay close to airport. Was clean, small, and noisy. My sister and I shared room. About 8 of us ate dinner in restaurant at hotel since not sure where to go? It was average, nothing special, ordinary food. I think next time will find a place with a little more character. As a result of a very late arrival, we needed somewhere to stay at Rome Airport and chose the Best Western. It is a modern functional hotel which has all the facilities you need. It is clean and comfortable and so very suitable for an overnight stop at the airport. It also has a shuttle to the airport (not free unlike most other shuttles I have used). "Great location, service and staff "
Stayed here after our Mediterranean cruise the night before we departed back home. We arrived early prior to check in time and Francisca helped us with no hesitation. Room was clean, cozy and accommodation is was what we expected. Airport Shuttle reserved for the morning flight for a small fee, staff was always welcoming and warm. I'd stay here again for sure! Recently stayed at this hotel for one night bed, breakfast and evening meal. Arrived around 5pm and were provided our rooms. There was four of us. The rooms were small albeit functional and what you would expect for this classification of hotel. Meals were to be served in the restaurant within the hotel. We were provided a slip of card for us to show the restaurant prior to ordering to indicate it was for our evening meal. The general layout of the hotel is ok however the area its situated in is a not the best and looks rundown. Upon attending the restaurant we were greeted by the young waiting staff who directed us to a table and seemed attentive. We were provided leather bound menus and therefore handed in our evening meal slips. The leather bound menus were quickly removed and replaced with a small laminated menu with a very limited choice. However we ordered and waited. Lots of patrons came in sat down and ordered meals. The food looked really nice. We waited and waited people came in after us, orderd and were served whilst we waited. After an hour I enquired why the delay but was offered no explanation. Eventually our orders arrived and mine spaghetti carbonara was cold, shrivelled up and very very salty. My friends American Pizza was a pizza base covered with hotdog sausages and chips ? Totally bizzar. The food was awful with no apologies so we left and had to got outside to look for somewhere else to eat. The customer services was incredibly poor and no help provided. They really don't care about their customers especially tourists. The restaurant food served to us was dreadful. I would not use this hotel again. No manager was available either in the evening or the morning when we gladly left. AVOID. Great hotel, conveniently located right by the airport, with friendly service to match. Our room was a little dated, but the wifi worked well, the bed was comfy and the showers were powerful and hot - it was exactly what we needed! 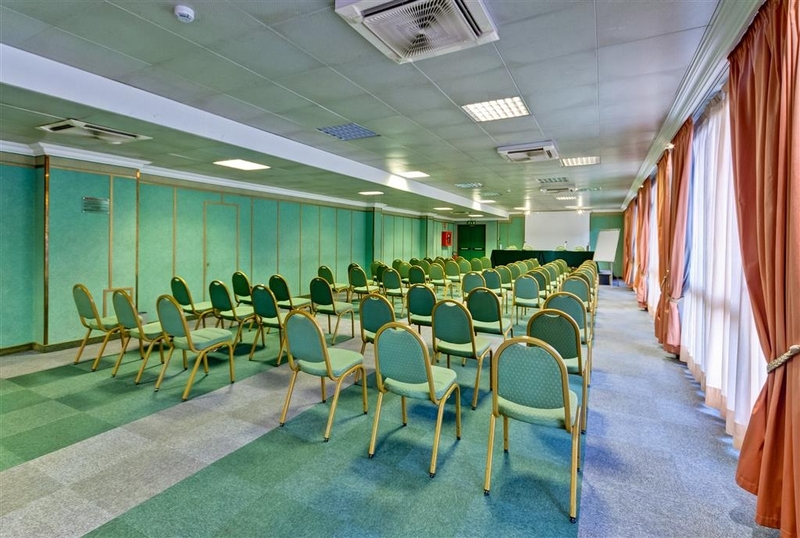 The Best Western Hotel Rome Airport is conveniently located for Rome Airport and the the Port town of Fiumicino. The hotel is comfortable with modern facilities and a pleasant restaurant on site. The Port, Mediterranean Coast and many restaurants of Fiumicino are within walking distance. "For the price we paid - excellent"
For the amount the room cost less than 24 hrs before arriving, I thought this hotel was great. It was near the airport, clean, helpful staff and had a nice breakfast. If your looking for luxury, this isn't it. But as a good standard hotel close to the airport with comfy beds - can't fault it. 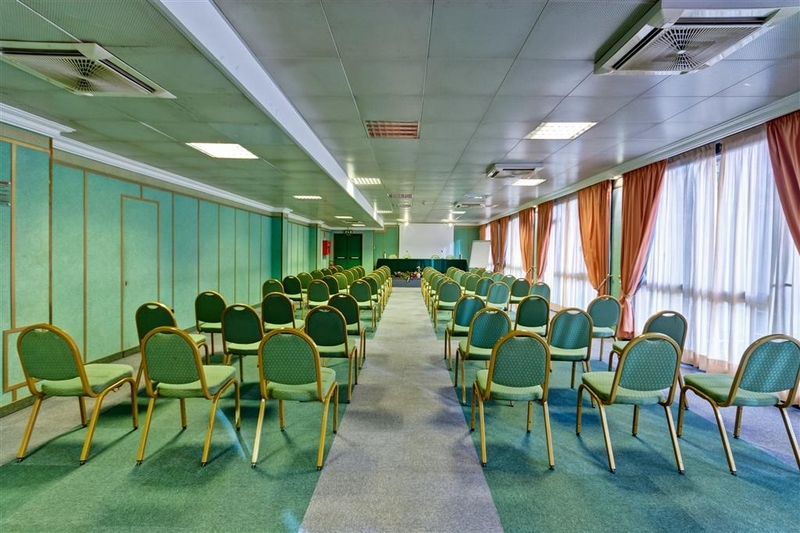 "Nice hotel near airport "
This Hotel is about 10 minutes from Fiumicino airport. Parking is easy. Rooms are clean and spacious. Bathroom is normal. Area is calm and easy to find when you have a gps. Good for a sleeping night prior to an early flight. Quality vs Cost is well balanced. Would stay again. "Great stay at the end of a 10 day Tuscany trip"
This hotel was a fantastic surprise. We were booking a hotel that was close to the airport and were not expecting much. The pool and patio is VERY posh and relaxing. The service was friendly and amazing. The shuttle to the airport was easy to book and on time and efficient. We found some very authentic restaurants within an easy walk from this hotel that were affordable and delicious. Although the hotel is not in a scenic part of town it is a great location to stay one night before you fly out of the Rome airport. "Scam when booking Room with Best Western"
I booked one room prior prior to my trip to Italy. When I arrived at the hotel they had me as registered for two rooms. I was than charged for two rooms. I only stayed in one, reserved one but they would not so anything to credit my account. I have tried to do everything possible to get this resolved but the Best Western is horrible to deal with when you do get someone on the phone. Once they have your credit card buyer beware. This is a scam and they do it. I would never stay at a Best Western Hotel again. "Decent for the price "
I stayed here before an early flight the next morning. They claim to be 4 stars but I'd say it is the typical American motel style place. Room was clean enough and staff were nice. I took the first airport shuttle of the morning at 430am and had to pay 10 Euro (they tell you 8 and then when I went to pay they asked for an additional 2 Euro for city tax—good thing I still had money left). It looked like you only had to pay for the early morning and late evening shuttles but you'd need to confirm. The town is nothing special but the hotel restaurant, Concorde, was better than anticipated. They didn't open until 7pm for dinner (I had wanted to eat earlier so I could get to bed sooner). I was tired of pizza so chose the pesto gnocchi and was pleasantly surprised by it and how quickly I was served. Not sure I would stay here again but it met my requirement of a budget hotel. We were here for only one night but it was absolutely perfect. It is located very close to the airport. They offer a shuttle service - for a fee - from the airport and back, but, because we were tired and didn't know where to find the courtesy phone for them to pick us up, we took a taxi. Check-in was a breeze. I had requested a room on the first floor and ours was just a few steps away from the reception area. Our room was just terrific. It looked like it was brand new. My sister and I shared a very comfortable king-size bed. There are night stands on each side of the bed and electrical outlets too. There's also a nice size flatscreen tv. The room was immaculate. You could have eaten off the floor. The bathroom is a good size with nice fluffy towels. Breakfast is offered at the restaurant on site for a very nominal fee. I think it was something like 5 euros. They offer a buffet and you won't go hungry. There was cereals, turkey pastrami and bologna, cheeses, breads, rolls, croissants, cakes and tarts, fresh fruit, yogurt, scrambled eggs with cheese, hard boiled eggs, bacon, little sausages, an espresso machine and juices. This restaurant is also open for dinner in the evening. A special hello to Francesco and Rosanna at reception. They were exceptionally nice and helpful. A joy to deal with. All-in-all, this was a great hotel. Nicer than some Best Westerns in the U.S.
"Safe and easy place to stay near Rome Airport"
Going as a family to Rome? Need a place to stay overnight? We stayed as a family of 4. Clean. Breakfast lovely (but may be an extra fee.) If you forget your adaptor they have those on loan. They have a shuttle from Rome airport until 10 or 10:30 pm; we arrived later so took a cab. "Very comfortable hotel at good price"
If you are flying from FCO airport this place is a great stay. Very close to the airport. The hotel has good size rooms, very comfortable bed, warm and clean. When we booked we didn't realize the breakfast wasn't included, so better check when you book. However if you want there are couple of supermarkets within walking distance and you can get fresh pastry for the room. Complimentary water is not included, but there is a kettle in the room with some tea and instant coffee. The bathroom provides toiletries and good towels. We were in a room with disabled bathroom, which is fine, but they didn't inform us at the check in and as a person of a medium height there may be some problems with the height of the toilet itself. The hotel also is situated right under the flight path, so be ready to see and hear all the planes landing, but night time it didn't cause any issues. Overall this is a good hotel and our stay was pleasurable. "Last night in Italy - basic but good!" We opted to stay at the Best Western due to its proximity to the airport to catch an early flight the next day and the need for parking. It was cheap and cheerful. It was a strange mix of old and new, with the hallways in need of an update, but the room (the main thing) being very modern and clean. It wasn't clear if the hotel provided free/paid transport to Rome or Fiumicino Airport and I'm still none the wiser, but we managed to walk to a nearby Terravision bus stop and got the bus to Termini Rome for 5 euro. 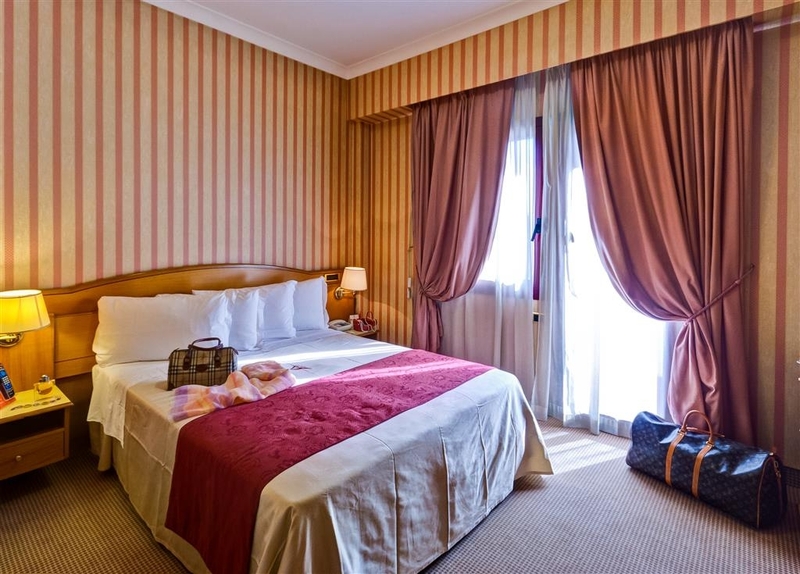 Overall, a good stay in a very competitively priced hotel close to the airport. 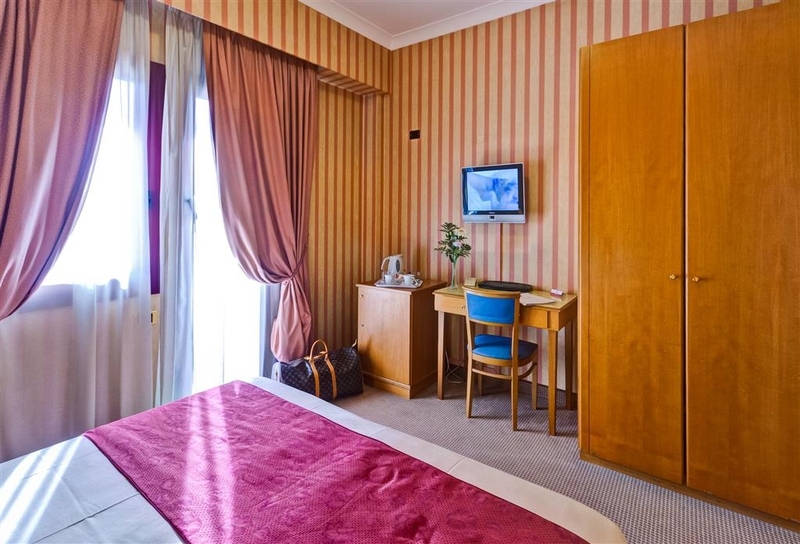 "Comfortable cosy room very close to FCO Airport with some closely dining options." Location Located about 10 minutes drive from FCO airport. There is a shuttle service offered every 30-45 minutes pick up and drop off and costs 7 euros each way. Within the location is a Chinese restaurant, fast food pizza place and an Italian restaurant. The hotel also offers a restaurant. I used the fast food pizza place that can be sold by the slice, delicious and reasonable- great for take away in the room. To get to centre of Rome or Vatican it takes about 30 minutes by car. Room The room was quite cosy and spacious offering a comfortable double bed with bed side tables with good access to plug sockets. Faces a large TV with cable and various channels offered like BBC news. Small desk with kettle and also a comfy wide arm chair. Overall nice finish in wood with digital AC controls. Bathroom was also finished in wood and offered a large shower cubicle with dove dispenser soap. However there is also Best western branded amenities like body lotion. A bidet is also offered. Quite comfortable and clean room that was quiet. But did hear planes fly over so not fully sound proof but was able to sleep. Facilities The hotel has fast WIFI that worked well. 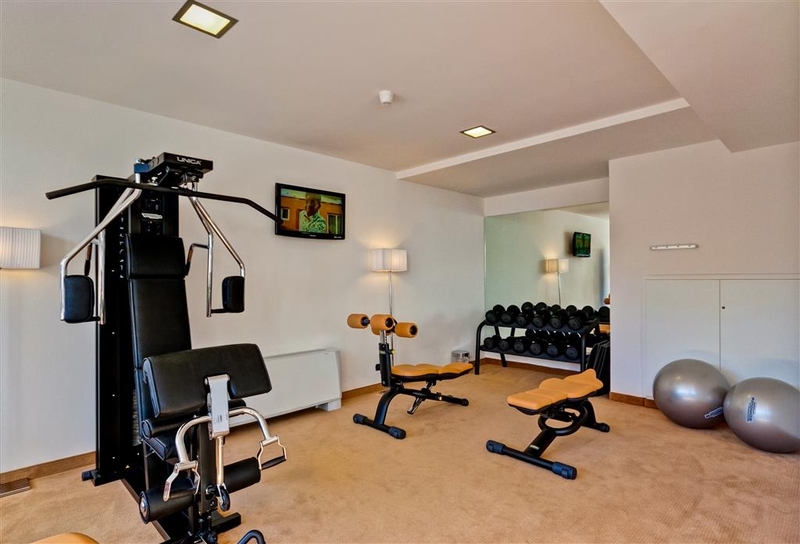 There is also a gym and swimming pool, i think outside though did not see these. They do rent bicycles as well. Plus a large premium restaurant within the building. Was not there long between flights but seemed to offer some good facilities for a airport hotel. Staff Staff polite and friendly including driver. Fast check-in and out. Overall a great option for stay between flights at FCO airport with some dining facilities just outside. Would stay here again. slept well found it clean and functional though desk is quite small. Had super early flight out of Fiumicino airport, so switched to this hotel the night before my flight. Very professional and responsive staff. Even the maintenance staff. The first room I was given had a problem with the bathroom sink. The maintenance man who came to investigate didn't speak much English, but made it clear I would need to move rooms by repeating "another room, another room" so I started to get my stuff together to go down to the desk and get myself a different room, but a few minutes later, the maintenance man appeared at my door and kindly handed me a new key card for a new room. The rooms were clean and attractive, and look like maybe they were somewhat recently renovated, but I thought the elevator and the few common areas I saw looked in need of updating. The wifi works very well. TV reception is good. Water pressure is great. Bathroom amenities and linens are nice. Bed is comfortable. The restaurant is quite good and the staff there is exceptional as well. The shuttle bus doesn't run 24/7. For three or four hours overnight it doesn't run. It didn't start until 4:30 and I needed it between 3:30 and 4 am, so I tried using the MyTaxi app as I had been using in the city, EXCEPT after numerous tries over 20 minutes and no success with the app hailing me a cab I ended up trying Uber and had a car in minutes. The lady at the desk said she could have ordered me a cab that would take a credit card (I wanted to use an app because I had no cash left), but I felt I had more control over the cost of the fare with the app (maybe that's a false sense of security I don't know). A few bad experiences with foreign cab drivers. So just beware if you have a really early flight and are trying to use the MyTaxi app - you may have trouble getting a cab to this location. Overall, I have no complaints with this hotel - I wanted a comfortable room in a location close to the airport for an early morning flight and this served that purpose very well. "great choice for overnight convenience near the airport"
We stayed here because it was near the airport, and we wanted to be close for a flight the next day. For that purpose, it was a very good choice. The people at the desk were very pleasant and spoke English fairly well. Our room was in building one, the same building as the restaurant and fitness room. There seemed to be other buildings as well, so rather than a highrise building, the hotel consisted of several two floor buildings spread out, giving it a comfortable and relaxed fee. There is also a pool for those spending more time there, but we did not make use of it, and it was probably closed up for the season anyway. We checked in at night and left in the morning, so I did not notice it. Our room was pleasant and looked as if it was fairly recently renovated with carpeting, wall paper and nice window treatments. We had two "twin" beds that we moved together, but these were very narrow twins, so together they probably formed one full size bed. Nevertheless, it was adequate, and the bed was comfortable. The shower was very small, but it did have a rain shower fixture that was nice but not much room to move around in. A large tv provided several English speaking channels, including CNN and Bloomberg. They have their own restaurant, but we chose to walk a minute away to eat at another restaurant on the same street. There was also a Chinese restaurant almost next door and supposedly a ten to fifteen minute walk to an actual town, but we decided to eat close by due to the late hour. They provide a shuttle service for seven euros a person each way. When at the airport, leave terminal 3 from gate 4, cross the street, and look for parking stall 3. I think they run every 45 minutes, but we were lucky and did not have to wait more than 10 minutes. Watch for a black van with no real identification as it goes to other hotels as well as the Best Western. I did not have breakfast which is offered for five euros or seven euros if you book once you are there. However, my husband did and said it was excellent with scrambled eggs, meats, cheeses, cereal, yogurt, fruit, a variety of cakes. etc. He thought that it was well worth the price. Overall, this hotel suited our goal of a pleasant and comfortable place to stay overnight for a next day flight. Stayed for one night at the end of our Italy trip. Staff were friendly and accommodating. Rooms are clean and comfortable. Ate in the restaurant for dinner; food, service and presentation was excellent. Didn't have breakfast but the set up was quite large and for 8€ seemed more than reasonable. Free wifi worked really well and there is a great looking pool with pool deck that's super clean and comfortable. Stayed with friends for one night because we had an early flight in the morning. Room is large with a great bathroom. The surprise is that there is a charge for the shuttle to the airport but that is not noted on the website. 7 € is about $ 8 US, okay but the driver dropped the whole bus at Terminal 3 which is a long walk to Terminal 1. Every one was flying out of Tetminal 1, about a ten minute walk after we figured out where to go finally. The driver also broke the pull handle on my carryon so that was fun walking 2 miles ( per Fitbit) to the gate. Second surprise. Little sign in the lobby that we did not see until too late states no personal food or drink allowed in the rooms. That is ridiculous...just saying. Third surprise. No alarm clocks in the room. Do they assume everyone has a cell phone for that purpose. I would never recommend this hotel for so many little irksome things. Dear Guest thank you for your feedback. I would like to apologize for not exceeding your expectations. Your satisfaction is important to us and we will be using the feedback you gave us to implement improvements to ensure we offer a better experience for guests in the future. We are sorry to contradict you but that the shuttle is not free is on all our websites and social networks. To book it, contact the reception desk and always remember the cost. For the driver, thanks to the report, we will ask for explanations as soon as possible. Usually the customers are asked the terminal where they have to get off and several stops are made, not all customers are left at the same terminal. On this matter we will take the right measures with the person in charge of the service. We regret that you did not read our directory on the desk where it says that the wake-up service, as now in all the hotels in the world, is available by calling the reception. Best regards. "If you need a hotel close to the airport this is IT"
My companion and I stayed at this hotel for two (2) nights, during a layover between the end of a cruise and a flight back to the US. It is a very modern hotel, and there is a restaurant on the premisses. The staff is extremely helpful and friendly. They know how to make a traveler feel welcome. I have no hesitation in saying that if an when I'll go back to Rome this hotel is "home away from home". Very clean, nice room, beautiful bathroom. Friendly helpful staff. We had a rental car. Appreciated free parking facilities at the hotel. Very close to and easy to drive to airport. Very nice fitness room. "Good location! but charge for SHUTTLE Bus from airport and it´s not said in the website"
It has a good location, with price, but it never saids that Best Western Hotel Rome Airport charge for the shuttle, It must said in its website and we have never choose it. If you added shuttle and breakfast is most expensive than other ones that are better. It´s sad that don´t be clear since the beginning. Don´t go to the restaurant, even pizzas are horrible!!!! I had stayed in the the hotel in the end of September/18 in the last day of the trip due the flight was really early in the morning. Hotel has new rooms but common areas are outdated, the floor that I was were really dirty and need maintenance. The airport shuttle is charged (8 euros per person). Uber costs 15 euros so for more than 2, uber is cheaper. It is a hotel for 1 night only if you want to stay near the airport... apart of that avoid! "Lovely Hotel With Lovely Clean Pool"
Great stop over and even had time for a did in the pool. Warm welcome and the room was very clean and well stocked. Had room next to lift which was a little noisy but all in all a great stop over. Food was fantastic lots of choices for breakfast and regular shuttle bus to airport. rooms are dated. shower in the washroom is tiny. close to airport and airplanes fly over head. bed a bit squeeky. very pricey given location. youre not even really paying for convenience...... airport shuttle is 7euro each way. The hotel was a great and convenient short stay for me, and very helpful with everything. Unfortunately I forgot my expensive headphones, but Barbara in the back office found them and sent them to Denmark, she and her colleagues were super helpful during the stay and in the whole process of getting my beloved headphones back. Nice people! Hotel is very handy to Fiumicino airport. Great staff! Reception area is up to date but hallways and hotel room very dated and heavily soiled carpeting. The bed and the bedding were fine as well as the bathroom. Not worth the money we paid. Should not be rated four star. "Italian Style - but Cheap on offerings!" "Great hotel but hard to get to"
"Newly refurbished nice place to stay"
We stayed here the night before our 7am flight out of Leonardo da Vinci Airport less than 10 minutes away. Be aware that if you want to check in before 2pm, you must pay a €25 fee. We had just got off a cruise ship at 7am, so we gladly paid the fee. We also paid €130 for hotel arranged transport from Civitavecchia to the hotel which turned out to be competitive. Why there is NO train service between Civitavecchia and Fiumicino is beyond me. Our room appeared recently refurbished, and was quite nice. The bathroom and shower were large and impressive. Air conditioning worked well. The Sunday “breakfast” was mediocre, and the coffee machine did not work. The new pool area was nice with an infinity pool. The sound proofing is poor. You can easily hear traffic as well as aircraft taking off over the building inside the room; this was the only disappointing aspect. We took the 5am shuttle from the hotel to the airport the next day for €8. Even with all the extra charges for early check in, “brunch”, and transport, it was still cheaper than the airport Hilton. I would probably stay here again. The hotel rooms are tired and run down. About what you'd expect from an older airport hotel. Staff are ok. The main problem is the airport shuttle - despite reading their website and calling them, I could never find it from the airport. The pickup location had changed and there was no sign posting of any kind, so you're at the mercy of the greedy local taxi cartel which also picks up from the same location. Then on the way back the hotel runs the shuttle infrequently and actually charges you 7 Euro each way! Total ripoff for a bad service. This hotel is convenient to the airport so good for an overnight upon arrival or before a flight. The front desk was very unfriendly and not at all hospitable. They paid no attention at all to our requests. We arrived a little after 10:00 AM and could not check in, but I informed them that we had only 2 people instead of the 3 guests that we quoted in our reservation. When we came back after 2:00 to check-in. They sent us to a room for 3 (midgets) and then got huffy when we advised them that we need a room for 2 onnly with seperate beds if possible. The very same man that I spoke with before said that they were not aware of this and treated us as somewhat lesser human beings. The following morning we went to breakfast arriving just 15 minutes before it closed. They were already tearing down the buffet and took things away right from in front of us then started cleaning while we were eating. The whole expereince left feeling as though we were totally unwelcome. Only the housekeepers were nice. After a four hour drive and returning cars at airport we really looked forward to a cool swim in the pool. 34 degrees ouside and our kids needed a swim. On on arrival staff at reception told us the pool were closed due to a private party. At that time no one was using it but I guess later during the day. Receptionist only said oh it' s not my fault, you can fill out a complaint form. I just don't understand how that would have helped us to use the pool? When asking for the manager she said that since it is weekend he is off, in most hotels there's always someone responsible at all times. They must have known about this some time ahead and they could have emailed the guests so we could cancel booking and find snother place but no info at all. Other than that our double room was very small and breakfast not more than ok. I e-mailed hotel 3 weeks ago but no answer. "More than good for airport hotel"
Stayed here for one night only. Came in after midnight quite a big hotel. Parking is not much but we managed to get the last spot. Quite large hotel with several buildings partly interconnected. We stayed in the old part which was pretty dated but clean and well maintained. However the design was old. Room is of average size but quiet and the beds are good. After a short night I attended breakfast. Take a good look around because one part of the buffet is on the other side off the room in the restaurant. Noticeable but with my short sleep not for me. Buffet is a average but good buffet. It has all you need. Great about Italy is that you can order the good good good espressos and cappuccinos. They are sooo much better than any of the machine coffee. And this hotel was no exception. Been only on the Wi-Fi shortly. But it seemed ok. Anyway we checked out and continued our journey. Just a good airport hotel. Nothing fancy but also nothing wrong! Oh and it has an outdoor swimming pool and indoor fitness. "Good luck finding the shuttle bus. " We had a horror time trying to get to the hotel from the airport. Its over 3km from the arrivals terminal so you need transport. Their information page states they have a shuttle service from the airport but good luck finding it. The phone number wouldn't connect and when we asked airport information they said that it was a private shuttle so you need to contact them yourself. We ended up taking a taxi for 28 Euro for 3 people with bags. Reception advised us that it is difficult getting the shuttle (??) because you have to go to Hertz and book it there(!!) Well that's a convenient service- not! To top it off it costs 7 Euro each. Rooms are modern and comfortable. "Overnight for early morning flight"
Pleasing Hotel with friendly staff, updated checkin area, outdoor pool and onsite restaurant. We only stayed for an early morning flight and were happy with our clean spacious room for 4. My children enjoyed some time splashing at the pool before we at some pizza at the onsite restaurant. Perfectly suited our needs. "Expected More from Best Western"
SO, decided to stay in an American chain near the airport as wanted good air air-conditioning and TV for our last night in Italy. Well, that was a huge mistake. Check-in went well. Cool and inviting in the lobby, friendly staff with great English skills (although we understand some Italian, so not critical.) Got assigned Room 219 and the first clue was that the halls of the building were HOT. Not warm, but HOT and stuffy. Got to the room and the phone was ringing. The person asked if we'd complained about the A/C; we hadn't. YET. Our room was tiny and the A/C was not turned on. The shades in the room were open but the windows were closed. It was past 6pm and the sun must have been beating down on the building all day. It was over 36 degrees Celsius (97 degrees Fahrenheit) outside. We turned the A/C on and waited about 20 minutes but there was no sign of cooling unless you stood on a stool and put your hand an inch from the one vent. Then and only then you could feel a modicum of cool (not cold) air. We called the front desk and a wonderful porter came within 5 minutes and said that it was working but slowly. I respectfully disagreed and went to the front desk to change rooms. The woman was very sympathetic and found us Room 232. This room was also HOT, but at least had a French door to a balcony and was facing east so wasn't subject to that hotter afternoon sun. The A/C was similarly useless, so I took a cold shower and we went out for dinner. The porter kindly suggested a nice restaurant in town. We came back about 3 hours later, all the while while the A/C was supposedly cooling down the room. The temperature hadn't changed one bit. Still 90+ degrees in the room. We opened the door and it was only 85 degrees outside, so a small improvement. Watched World Cup soccer, fell asleep and just glad to get home the next day. The staff did their best with limited resources and were doing what they could, but the facility wasn't up to any standards with regard to basic comfort in the heat of summer. Just don't stay here unless it is winter time. We needed a hotel close to the airport in Rome for just one night after a tour of Italy. This was a good choice. Clean and comfortable. Shower was a bit small. This is actually an older hotel that they have added on to, and the new part - which is the lobby and pool area, is quite modern. The rooms are in the older part. The hallways were very dark. We were traveling with seniors and the dark hallways and small bathrooms were a challenge for them. We did eat a quick dinner at the on site restaurant. Service was slow, but the pizza was pretty good. There was a reception going g on at the pool area so I think the staff was trying to do too much with not enough people. The real bright spot here was the airport shuttle. They had a clean van, were on time, and had a built in step stool for the senior citizens traveling with us. "Save yourself time and money -stay at the Airport Hilton"
Do yourself a favor, don't stay here. Bad A/C in rooms, $10 per person for a shuttle fee, uncomfortable beds and dirty room. No thanks. By the time I paid their add ons, could have stayed at the airport Hilton. In case you are thinking about taking a taxi, they all charge MORE then the shuttle. I've traveled all over the world and never experienced this from an airport hotel. Avoid this place. I was here for just one night before leaving the area. It is a 15 minute walk from Termini, pulling a suitcase. The rooms are large with a bath/shower and good air conditioning. The breakfast is very comprehensive with attentive staff ready to provide fresh coffee. "Clean rooms ,Inconvieient Restaurant hours,Pay for Shuttle to Airport." Nice staff,clean rooms. Very glad I didn't take the train from Naples to airport and call for shuttle.7euros each one way...train 14 euros each...Just take a taxi and be sure its the “real” Rome taxi,basically same cost.No restaurant availability until 7PM after. Long day....Pzza place around the corner....cheap and a convenience store with food. We spent a night here prior to our early morning flight leaving Rome. It does have a shuttle for fee (about 5-10 Euros less than the taxi fare) but the shuttle does have some limited hours, unless you request a pick up from the airport, so check into that first. (we ended up taking a taxi to the hotel, as we arrived at the airport in the morning and the shuttle didn't start its pickup runs until 1pm.) Beside that, the hotel was very clean, our room was updated, the service at the desk was effcient, and we were able to walk to the harbor where there are many restaurants and a supermarket along the way. There was overhead airplane flight noise intermittently, but it stopped by around 11pm and didn't wake us overnight. It was a good option for the price, and we were able to take the 5 am shutlle to the airport the next morning. "Double charged for breakfast and claim they can't refund *BEWARE*"
Whilst the stay was fine they charged us twice for breakfast. First they claimed that they had not, then admitted their mistake and offered to send a cheque because they could't refund my credit card. Then offered a $25 discount to stay in one of their hotels again. I know another has suffered this fate and doubt that it was accidental. "Decent hotel. Terrible customer service. " My wife and I booked a room here to make traveling to the airport for an early morning flight easier. The price was fair for the room, however once all the additional fees for transportation to the airport and the "free" breakfast it would have been cheaper to stay at the Hilton at the airport. Customer service and reception desk are not helpful at all. The onsite restaurant charges outrageous prices for lowsy food. We are extremely dissatisfied with the experience and will not be staying here again. This was our second stay at this hotel conveniently located near the airport. We used the shuttle service from and to the airport as well as the shuttle into the centre of Rome. Rooms are small but clean. We did not have hot water either day which was a nuisance. "Decent Hotel. Staff Did Nothing to Help. Don't Do It." We were there for 1 night. Early check-in costs $25 euros. Shuttle $20 euros..if they actually answer or don't hang up on you 3 times and you have to take a $50 euro taxi back. The shuttle didn't even drop us or the passengers close to our destination (Colosseum). The staff was not very helpful and over charged us. Shuttle cost of $24 euros each way, for two people. We didn't take it back and we didn't even get to our destination in the first place. They blamed it on us that we couldn't speak english well enough? I'm from North Carolina haha. I travel the world for work and this was my girlfriends first experience and Italy let us down huge. We chose this hotel that is near to the airport as our flight was a late one en route the next day to Sorrento. Staff very accomodating and helpful, rooms fine, breakfast ok. Managed to get the last shuttle from the airport to the hotel. Would we stay here again? Yes. We needed a place to stay near the airport for our first & last nights in Italy. It took a few minutes to locate the shuttle location at the airport as this had changed recently but, we soon found it - right outside the exit door in the central aisle where all the minibuses pull in. Price has gone up to 7 Euros each way recently. The hotel staff were super friendly and helpful. Our room looked brand new so may have been renovated. It was a bit small (hence the 4 stars) but very clean, comfortable beds, windows that opened (yeah!) and a little balcony. It was late so we ate at the adjacent restaurant where you can charge to your hotel room. Lovely meal for 2 of seafood risotto, spaghetti al console, bottle of wine & water all for 50 Euros. The breakfast buffet was also excellent and only 7 Euros each. There are several other restaurants walking distance from the hotel so we may try one of these for our final night next week. "A Last Night in Rome Option"
We tried to find a hotel close to the main Rome international airport to make our preparation for flying out the next morning easier. The Best Western seemed like a nice choice: reasonable price, photos looked good, decent reviews, airport transportation available, very close to the gates. Good choice by us. Plusses: In addition to the above, there's a restaurant on premises, though I'm not entirely sure of its ownership relative to the hotel. Room was clean and seemingly either new or renovated. Negatives: Charge for airport transportation, odd layout for hotel, irritating music played on outside speakers that blared into our room, some rooms are noisy due to proximity to road and sidewalk. All in all, I'd probably stay here again but would ask for a room not in the 1980 numbered series of rooms. "Next time I will choose Hilton"
Best Western is usually a nicer than average place to stay, but not this one. There was veranda renovation above us with plaster raining down into our veranda. They moved us to a (smaller) room across the hall and there were cigarette butts on the floor of the veranda (nonsmoking room so apparently an ash tray was not provided to the previous guests). Even though the hotel has air conditioning be aware it is not available in April! The room was stuffy and warm and maintenance had to come to get the window open for us as it was not functioning correctly. Additionally, the hotel did not have a fan we could use for sleeping with the window shut to block outside noise. We never could find the airport shuttle to the hotel and couldn't get clear instructions on where it was. Very frustrating! Next time I will stay at a Hilton where I can have A/C in April if I want it and the airport shuttle is free and convenient. "Very nice stay once you get there"
We needed just one night before picking up a car to visit Italy. This Best Western was an excellent choice. The staff was extremely helpful and very pleasant. The room was comfortable and clean, the bed was very comfortable. The breakfast was amazing. Lots of choices - bacon, sausage, eggs, ham and cheese, many fruit and juice choices, loads of pastries, coffee, etc. Our only problem was finding the shuttle at the airport. Due to construction the pickup site has been changed, BUT the directions on the automated phone message sent us to the old place. Very confusing. Took calls to the hotel to finally get correct instructions. It cost us a lot of time. "Very hot room! Staff excellent though!" From a positive point of view I would like to say that all the staff at the hotel were lovely. Check in was fast, friendly and efficient and we had a nice meal in the hotel restaurant where staff again were great. We really appreciated that restaurant manager Amro took the time to have a chat with us - a very charming and courteous gentleman. It would be nice if lights could be dimmed a little in the restaurant during the evening to improve the ambience - the bright lighting made it feel a bit like a canteen! Breakfast was plentiful and good value for money. Based on staff performance I would have recorded a Trip Advisor score of 5 I have however recorded an overall score of 3 for the hotel based on our experience in our room. We found it incredibly hot and the air conditioning unresponsive. We had to have the large window open just to make it bearable and consequently had the noise from the flight path to contend with. Our toilet flush was very temperamental and the shower head was hanging off to one side and sprayed the bathroom with water when we first turned it on. My husband had some success trying to tighten it up which did help. Apart from the above points the room was very clean and the bed comfortable. "Excellent staff / Stuffy room"
Hotel staff and location was great. Very good breakfast (5 Eur). Worst part was there was no A/C. We were told that they were not allowed to turn on the A/C this early (April). Our room was warm and stuffy. Only way that we could get any ventilation was to open our balcony door and window. This was not a good remedy as this is an Airport Hotel that is directly under the flight path of arriving and departing aircraft. We had to leave door and window open all night which left us feeling less than secure. My daughters stayed here after arriving in Rome for one night to catch the train out of the Rome airport to Sorrento. One of my daughters left her passport in the hotel room and was not sure where she misplaced it. When we called the hotel, we were happy to learn that the maid staff turned it in and it was safely being kept at the front desk. We were so relieved that it had been found and we did not have to waste time (and Money) going to the embassy to replace it. Luckily we were still in Rome when we realized it was found there. We were so grateful to the staff and Monica (I believe that was her name) that retrieved the passport for us. My daughters enjoyed the accommodations. Clean hotel and close to the airport. Be aware that the shuttle from the airport is not free but much cheaper than the taxis. My girls' flight was delayed and they missed the shuttle because it stopped running at 10:30 pm. One taxi driver wanted to charge her 40 Euros because he knew their shuttle was not running. Luckily, my daughter told him to take a hike and she found another guy that transported them for 20 Euro (which is still a lot seeing that the hotel is only about 4 km away). So be aware of the scamming taxi drivers! It's like Tijuana ... you have to barter! I believe the shuttle is 6 Euro per person so they only paid 8 Euro more for the taxi. I was just grateful that they made it back safely to the hotel that night and the passport was found! Thank you Best Western! Only recommendation is to run your shuttle for 24 hours to avoid the scamming taxi drivers! Spent one night before an early flight from FCO. The hotel has a shuttle for 6 Euros each way and is only a 5 minute ride. Although the website and recorded message says to find the shuttle at mini-bus slot 16, the mini-bus positions are under construction and not available. There is no sign stating this and I had to call the reception to find out the pick up was between doors 4 and 5 in Terminal 3. It is also difficult to identify the small bus as being from Best Western. The room was nice and the restaurant was ok but not great. They had a large group (30 or so) of young people in the restaurant the night I was there. I was told there was no pizza available. Then the young people arrived, they were immediately served pizza. So, I guess all the capacity for making pizza was reserved for the large group. That wasn't a big problem for me and I understand they were trying to take care of a large group. All in all, I recommend the Best Western if you are looking for a place near the airport. "Francesco and Staff saved my trip!!" "Overnight stay due to flight cancellation"
Easyjet booked myself, my husband and our 2 friends into this hotel due to a flight cancellation. They charge a city tax per room like everywhere in Rome. Room was clean and there was an adequate supply of towels and toiletries. The hotel is 5 minutes from the airport and a shuttle will cost around 6-8 euros per person one-way. We took a taxi for 4 of us as was cheaper to do so, still costing 20 euros which is a rip off but Rome charges you to sneeze so what else do you expect? Staff were polite and there is tea and coffee in the room (minibar also available). Didn't try out the pool as the freak weather we have just experienced meant that I was not travelling with my costume, but it looked clean enough. Note that an advertised queen-size bed is effectively 2 single beds pushed together (not a queen size in my opinion due to the risk of falling down the gap should you wish to hug during the night). Mattress was firm and pillows were, well, pillows. Overall a swift and pleasant stay at your standard airport hotel, if you want a comfortable and clean place to spend the night, this will be fine. P.S. If you walk towards the harbour there are lots of restaurants and places to eat/drink and I hear that the fish is especially good. "A decent room and breakfast at a very good price"
Having followed the instructions (from the hotel's website) I easily found the shuttle to the hotel, for the 10 minute journey. I was a little confused as to how to pay for it but it was simply added to my hotel bill. I received a friendly welcome and booked the shuttle for the next morning before heading to my room. The room was comfortable and clean. The bed was firm, which suited me, and I slept well. I didn't time my breakfast very well as there was a young rugby team, with their parents, already at the buffet. If I hadn't had a flight to catch I might have waited for them to leave but as it was the staff worked hard to keep on top of replenishing the food. There was a fair range of options available and the quality wasn't bad. As I hurried my breakfast I was actually ready in time for an earlier shuttle, than the one I'd booked, which I switched to without any fuss. This was a clean, comfortable place to stay with a decent breakfast for a very reasonable price. The idea of a shuttle not operated by the hotel gave me reason to pause to think, before booking, but it was straightforward and everything went to plan. "OK value for service-challenged city"
To be fair, this was only my second short trip to Rome, and I find FCO to be an incredibly frustrating and poorly managed airport relative to other international airports. Therefore, I cannot completely fault the Best Western for the lack of transportation options to its property, despite the fact that it is only a 5-7 minute drive from the airport and bills itself as an “airport” hotel. *Firstly, the hotel shuttle's final airport departure is at 10:30pm (22:30), even though the hotel website says 22:00. No luck if your flight arrives later, and the airport's Information Counter is useless. *Secondly, do not attempt to take Uber, as the app seems to confuse the pick-up point; I stubbornly waited TWO HOURS for an Uber driver to finally arrive (it was the third driver, after two previous ones mysteriously canceled on me). *Thirdly, the hotel shuttle charges 8-10 euros one-way for this short 5-7 minute drive, which is cheaper than Uber but still feels like a rip-off for such a short journey. Clearly, airport hotels in Rome have no incentive to provide added value for customers by offering something so outrageous as a FREE shuttle; this type of fee is common. Check-in: Once I arrived at the hotel past midnight, the female front-desk attendant was helpful, efficient, and kind. Check-in was efficient, and a wake-up call was arranged and executed as promised. The building layout is awkward, as I had to go outside to an adjacent building, walk down a short flight of steps and up a small elevator and through a fire door to get to my tiny room. En route, I noticed the hotel's small but functional mini-gym, which appeared newish and clean, though I did not have time to use it. The room: I'm accustomed to small hotel rooms in certain cities and countries, and apparently small is the norm for Rome as well. Small is fine >>IF<< it is combined with efficiency and functionality, which are things this hotel needs to improve significantly. Cons: *Only ONE electrical outlet for my mobile devices in the main room *Broken light over the bathroom mirror *TV perched high above the armoire, just a few inches from the ceiling but not angled properly for viewing from bed *No complimentary water *Very slippery bathroom and shower floor *Confusing light switches *Dated decor Pros: Paid-in-advance, off-season rate was $53/night Free wi-fi Front desk offered to print out my boarding passes Gym and pool available Conclusion: if you are already accustomed to the inefficiencies and drawbacks of Rome travel or are traveling off-season, I imagine this hotel represents fair-to-decent value for a quickie airport transfer. If you're a newbie to Rome like me, staying here feels like booking a “Basic Economy” fare flight — it's good value if you keep your expectations low, and expect to pay for extras. If the rate goes above $100/night, look for other options. What a great hotel!! Location was wonderful, because we could get a shuttle to the airport for 8 Euro. Breakfast was free. They were very friendly and eager to answer all of our questions. The room was very nice! I would highly recommend this hotel. I will stay there again, and it was very reasonable. "Overnight say due to late scheduled arrival"
Lovely welcome to Italian style. Room smallish but very suitable for one night, everything we needed good shower, comfortable bed. Very good breakfast and transport back to the airport. All worked very well. One small point the airport pick up point is a little bit of a walk and on the right and side. We missed it and had to ask. The drop off point is by the checkin desks. My wife selected this hotel because of its proximity to the airport. The staff were very professional and the rooms were very modern. Several restaurants and bars were within walking distance. The next morning we got on the hotel's shuttle to the airport - it was perfect last night! 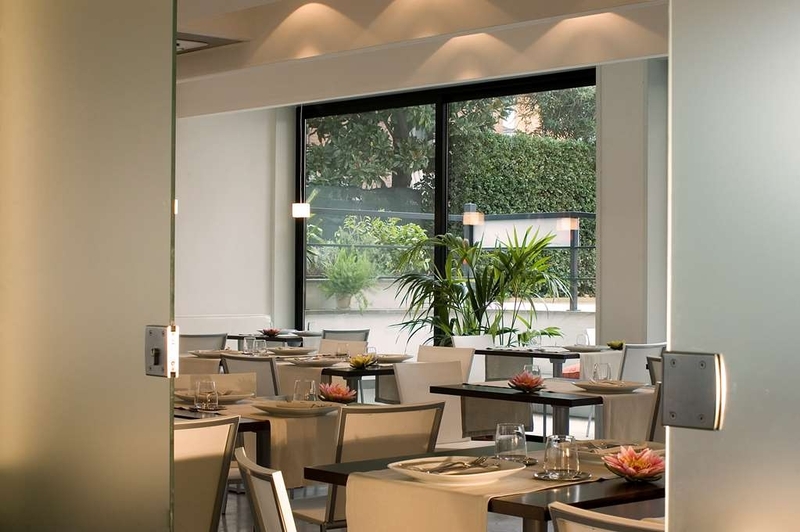 Located at 2 km from Fiumicino Airport, it's a good choice when your flight is cancelled. The breakfast is OK (for Italy), the staff is very helpful. I saw an outdoor pool - not very useful in December but, probably, good during the summer. Dear Guest thank you for your rating. We really appreciate your feedback. Best regards. 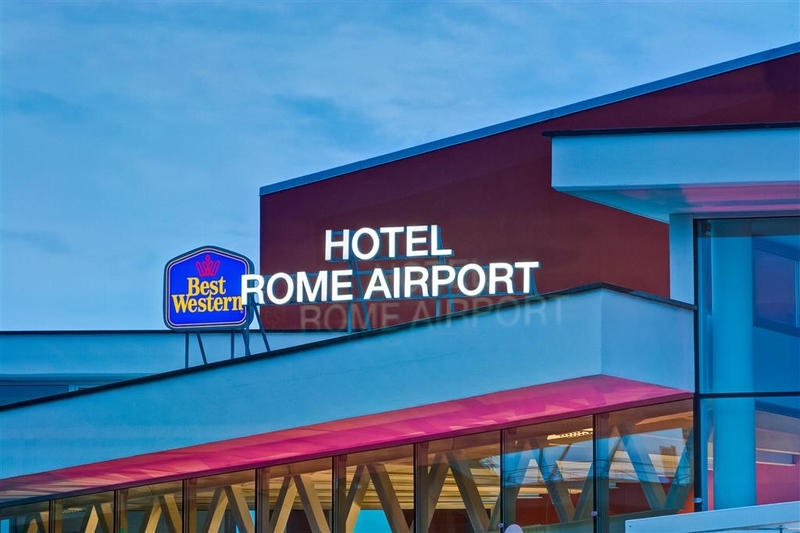 "Excellent choice for airport access"
Best Western Hotel Rome Airport We recently enjoyed a one-night stay at the Best Western Rome Airport before departing on a morning flight. The hotel shuttle bus from the airport and return the next morning was convenient and efficient. Our room was small but well furnished, including a very comfortable bed and a large bathroom. The busy hotel restaurant, accessed from the outside, was a welcome sight after a long train ride. The menu choices were many and varied. Our dinners were excellent, as was the service. This airport hotel is an ideal choice for a good night's sleep before a flight. It is very clean and quiet. We won't hesitate to return if we are flying into or out of Amsterdam in the future. Dear Madam, thank you for your feedback. We really appreciate your rating. Best regards from alll the staff. "By far the most miserable hotel experience we have had in years"
We may have made a mistake and accidentally booked two rooms instead on one. We arrived fairly early 1400 hrs and tried to cancel the extra room and were told we could do that for the second night we booked but not the first, we had to pay a one-night penalty. SO the next day I check out of the extra room and they said we had to pay for the full two nights. The hotel was nearly empty in late November, so it is not like we were taking a room they could have rented out. I requested tired to talk to the manager, a person named Maximo, but he was too lazy and cowardly to face an unhappy customer. The terrible management response was just the first thing bad about this place. The room's carpets were worn and had ground-in dirt. Not enough toilet paper was provided. No hand soap was provided. Though close to the airport, they have an airport shuttle you have to reserve in advance and which they state costs six euro each way per person. I'll bet there is a luggage charge too, though this is unstated. We went to their restaurant and it served smelly old prawns over ravioli. STAY AWAY! Dear Guest I am very sorry to read your anger towards us. This is evident from everything you wrote, including many untrue things. We are a 4-star hotel, it is not plausible to say that there was no soap present. Our courtesy line includes everything you need. We try our best to ensure guests a pleasant stay. Unfortunately we can not do anything about non-refundable bookings because we pay a commission. As for our restaurant, we have never had any complaints about the freshness of our products. Best regards. "An excellent place to stay for the airport "
Dear guest thank you for your rating. We try to do the best for offer you a pleasent stay. Best regards from all the staff! Excellent staff. Thank you Francesco and Alessandro! This hotel is a most convenient, comfortable and welcoming hotel for any one flying in or out of Rome. The restaurant is right on site and offers good food in a casual setting. An airport shuttle is available and there is also lots for room for parking. Dear Guest thank you for your rating. Your satisfaction is our priority. Best regards. 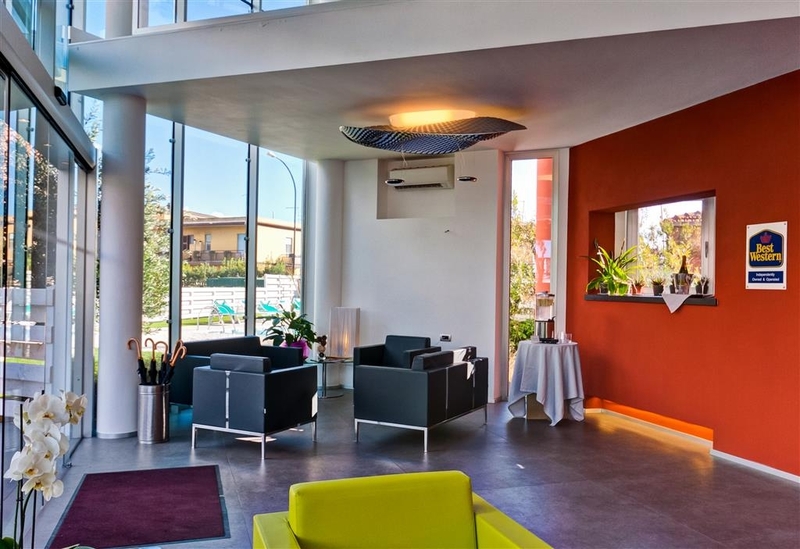 "Nice hotel and great parking deal near the Rome airport"
I was flying in and out of Rome during two trips and was able to leave my car at the hotel for a 4 Euro a day price and then one night was free when I stayed there for a very reasonable rate. Paid shuttle service to the airport, friendly staff. Dear Guest thank you for your feedback. We really appreciate your rating. Best regards from all the staff. "My husband and I stayed at this hotel on 31st August, 2017." At the front desk we met Francesco and Roberta. They were very helpful and pleasant. They answered all our questions very patiently. Our room was neatly organized, and clean with a beautiful bathroom.This hotel is close to the airport and they have a shuttle service to and from the airport. 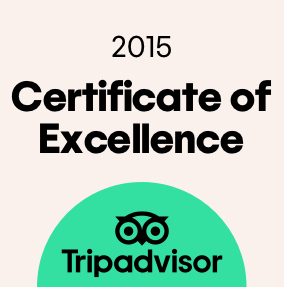 Our overall experience was very good. Dear Guest thank you for your feedback, your satisfaction is our priority. We really appreciate your rating, best regards. "Nice Hotel with Poorly Maintained Rooms"
This hotel may maintain a 4 star rating because of its facilities, which were fine. However, the first room we were assigned was very Spartan with huge stains on the carpet. The second room was just as Spartan, but the carpet stains were smaller. When we checked in the room temperature was 27C (or 80F). However, the hotel had turned off the air-conditioning as it was now considered winter. We could open the window, but we were right under an airport flight path. I should have known that its a bad sign went you check into a hotel and find earplugs in the bathroom. Nice clean facility, pleasant & helpful staff. 10 minutes from the airport, we used the shuttle at 6 euro each. Great stay for a night, right over flight path of the airport but not that distracting. We would recommend. Dear Guest thank you for your kind feedback. We really appreciate your rating. Best regards. Top tip: book a room in the new wing at the back of the hotel, away from the road. We had a balcony room right at the front by the road, and it is a busy road. However, the room, whilst small, had all we needed -including a tea tray - yay! Bathroom had recently been refurbished (tile cement left on the tiles) and the spacious shower had good water pressure and lots of hot water. No shelving anywhere to put toilet bags though - some basic toiletries provided. Comfortable bed and the overhead flights seemed to stop around 11pm. Could use a little more attention to cleanliness and room décor a little tired. You can use the PC and printer and print out check in/boarding cards FOC. The breakfast set up was good, with a nice range of hot and cold, and friendly staff. We didn't eat here at supper - as others have said, we were sick of Italian food by then, and walked a few years to the left to Miao Xian Ge Chinese restaurant and had a brilliant (and cheap) meal. Opens at 7pm and by 8pm was buzzing. We booked the airport shuttle for next am at check in and it all went fine and on time with a very friendly and courteous driver. 6 Euros each. Dear Guest thank you for your accurate evaluation and suggests. We really appreciate your feedback. Best regards. "Hotel close to Fiumicino airport"
Hi Tom, Welcome back! We often return to the states via Fiumicino airport in Rome, and use this hotel for convenience. We usually arrive late in the day, and depart for the airport early in the morning. The hotel is just 10 minute ride to the terminal, at a cost of 6 Euro. The hotel staff are pleasant and efficient. We age dinner in the hotel restaurant this trip and the food was delicious, wait staff outstanding. Dear Guest thank you for your kind rating. We really appreciate your feedback, thank you for your visit. We look forward to seeing you very soon! Best regards. "Close to airport. Good reasonable breakfast"
Hotel was close to airport, clean, offered good breakfast for 5 euros. When I left my wallet on transfer bus the driver took me right back and I got it. Very thankful. Had outside pool but it was too cold. Dear Guest thank you for your rating. Glad for your visit, best regards. We arrived at Rome Airport hotel and explored the waterfront area. Had a great pasta dish at the nearby pizza restaurant then walked down to the harbour. Watched families out for a Sunday stroll, fishermen, bicycles and had gelato at a wonderful shop where the waiters wore hats. Great place to spend out last night in Italy. The hotel was older but well run with attention to detail. The restaurant was absolutely the best. The hotel doesn't look that promising from the front but trust me it is well run and exceptional staff. "So nice to be so close to the airport!" This is a nice hotel with a fabulous pool! We did not stay long but it was a pleasant experience. Planes come to the airport close by but it did not bother us. Will definitely keep the hotel in our planning. I was pleased with the lobby and reception area where I needed to wait for a room comfortably. However, once in a room, I was disappointed that the attention to detail had not been maintained to the level of lobby appearance. Carpet badly needs to be replaced. The location is within easy walking to the city center and has a nice restaurant. I stayed here last week in room 139. Dirty carpet, dirty stained walls and an extra bed which makes the room even smaller. (I was alone) As the hotel is at the end of Rome Airport's runway, you get a 0545 hr wake up from the aircraft you can almost touch. No milk for the tea ( I know italians don't drink milk in coffee but this is supposed to be an international hotel) They provide an airport shuttle but sometimes its a 45 min wait. No hotel bar (as we know it) The Concorde restaurant was the only redeeming feature. Very good food and friendly service. My husband and I spent the one night in this hotel prior to our cruise. The hotel boasts a 4 star rating although I found it over rated. The room was old and tired. Shower too small to bend down in. Bidet badly fitted, you could not operate the plug. Food in the restaurant, overpriced. Staff on reception indifferent. Adequate for a one night stop, it had WIFI and a paid shuttle service. However my advice would be to look else where. I would not stay there again, area that it's in is not that special either. The staff here should not assume that just because someone is not from italy, that they cannot speak or understand Italian. The receptionist is possibly one of the rudest women I have ever had the displeasure of dealing with In all my travels. And as soon as I informed her I knew exactly what she was saying about me, her whole attitude changed. Disgusting. Will never stay here again regardless if it's cheaper than all the other airport accomodation. We only stayed one night at best western rome airport hotel. The location of the hotel is not far from fiumicino airport. Shuttle buses from the airport to the hotel are available at certain hours of the day. Their staff is friendly and helpful. The rooms and bathrooms are clean and well maintained.The food in the room service is available quickly and tastes pretty good. To find outside dining is not possible except for driving a car. This is primarily an airport hotel. It is directly below the flightpath so it is noisy. The rooms are old-fashioned and in need of upgrading. Fine if you need to stay at airport for one night but not any longer. Good breakfast provided. Shuttle to airport for 6 euro. Mixed feeling about this hotel , plus was own free parking, pool , nice enough breakfast and the staff at front desk wore nice to us. And we got a good sleep , probably beacause everyone else slept too since many people staying here have a early flight. When we arrived at the hotel cleaning of the rooms was going on and the whole floor was a mess with cleaningcarts and blankets all over the place so it was hard to get through with the luggage and nobody said hello from the cleaning staff , not such a good first impression. The toilet didnt flush so we had to call maintenance , but they fixed it right away. Door is hard to get locked. Room was got enough and we slept well so it could have been worse and if you think about the rate , its not expensive. Dear Guest please accept my apologies for the inconvenience during your journey. Thank you for your suggests. Best regards. "One of the worst hotels I've ever stayed in"
Last night I called from the airport to check the times of the shuttle to be told I had to reserve the shuttle in advance and I had to get a taxi. This morning I was told this was NOT true. Please see below the details of the shuttle from the airport. In July 2017 it was €6 each way, a taxi was €20. When I arrived in my room it was a single room NOT the superior queen room reserved. When my room was changed I'd struggle to describe it as superior, maybe just relative to the single room they originally gave me. This evening I returned to find that housekeeping had charged me for a coke from the mini-bar I hadn't taken - reception just laughed!! I know I shouldn't eat in hotel restaurants but there isn't much around - my medium rare steak arrived after 45 mins and surprisingly after all that time it was more than well done, the second steak after another 20 mins was well done but I couldn't wait any longer. The house wine is dreadful but it is the only wine by the glass. The restaurant's waiting staff are good but my advice is find somewhere else to stay. Dear Guest On behalf of our entire team, I would like to apologize for not exceeding your expectations. Your satisfaction is important to us and we will be using the feedback you gave us to implement improvements to ensure we offer a better experience for guests in the future. Please accept my apologize for inconvenience with restaurant service. I hope that you will consider staying with us again so that we can have another chance to provide you with a superior experience. Best regards. "It's Key Attraction is its Relative Closeness to Rome'a Main Airport"
I read some interesting reviews of this hotel before booking - some very good & some terrible. Our reason for choosing to stay here was the extremely good room rate we got (Euro 61) and the fact we only wanted to say here for around 6 hours, rather than spend this time sitting around the airport waiting for our flight to Australia. For this purpose, the hotel was fine. It allowed us to have a good rest, to relax watching some TV, have a swim in the hotel's pool, shower & a change of clothes before our long trip. Given the room rate we paid, it wasn't surprising that our room was located in the older, unrenovated section of the hotel. The room was fine. It looked as though it hadn't been refurbished since the 1970's (shocking wallpaper & old fashioned, heavy curtains) but the room was clean, bed & pillows were very good & bed linen clean. There was also a flat screen TV (but no remote, but we got one from one of the staff), a mini-bar & tea making facilities. The bathroom, although small, had been modernised and was spotlessly clean. I have read a number of comments about the air conditioning. As far as we were concerned, it was totally comfortable. The only grumble I had about the room was a faint, musty smell, maybe from old smoke & I don't think the windows were double glazed as the noise of the planes coming in was quite noticeable. Free WiFi is available, but in our room, connectivity was poor. Overall, the hotel suited our purpose very nicely. If I was staying longer than a few hours, maybe I would want to stay in one of the refurbished rooms, but if you stay in an old room, don't pay too much. There is a restaurant at the hotel, but we didn't use it. Regarding the shuttle bus, if you want to use it to get to the hotel from the airport (Euro 6 per person), the bus does not run before 1.00pm, in which case, you will need to get a taxi (from the local rank adjacent to the main airport taxi rank). Be careful you don't get fleeced. We ended up sharing a taxi with another person going to the same hotel and we paid Euro 20, after refusing to pay Euro 25. Normal rate (as per the metre, would be around Euro 10). Hotel reception can arrange a shuttle from the hotel to the airport. Dear Guest I have never read such an accurate evaluation as yours. Thank you so much for your rating, for us it is really precious! Thank you for being objective and seeing also the positive sides of your stay. Best regards. "Perfect for Early morning flight out!" This was a quick stop before a 6am flight back to the states. First nice thing is that they have a shuttle to the hotel. I flew in at 9pm and was able to jump in the shuttle with no problem. To get to the shuttle you have to walk to the far end of the baggage area and keep walking until you see spot 24 (23 or 24)...you will see the buses lined up -keep going. The shuttle to Best Western was a big multi person Van. when you check out you will be charged for your shuttle ride ...I believe it was 6 Euro - well worth he convenience. The room was sufficient for an over night stay - I personally would not look to this hotel for a vacation destination. They have a restaurant ....food was pretty good. The shuttle did not run early enough to take me to the airport the next morning - but it was only a 6 Euro cab ride - so not a problem. Staff was very nice and helpful. I would stay here again if I needed to be at the airport first thing in the am again. Dear Guest thank you for your rating. You are right our hotel is very much appreciated for quick stays. In fact, proximity to the airport is our strong point. We have facilities such as swimming pool, gym, bicycle rental, with which customers can enjoy the time available. We are glad to have offered you a pleasant stay experience. Kind regards. "Lovely Staff Michelle & Francesco"
"Great staff but terrible AC, wake-up calls never made, door locks work poorly"
Been coming here yearly for past 4- 5 years. Getting progressively worse in spite of friendly, polite staff. AC in both rooms hardly worked (though corridors very cold) and very, very hot in Rome in June... No wake-up calls (to either room! for early morning flight), door lock didn't work and maintenance came and said was fine and he reeked of alcohol. Carpet so badly stained I shuddered when I thought of using the bed. Changed to a wooden floored room with a non-workng tv - changed again to a room with a toiilet which ran all nite, light bulbs missing, sink aerator which sprayed all over, shower doors which wouldn't close resulting in very wet flooring and dangerous footing, inadequate venting which precluded use of mirror, Working with corporate offices now who report this location has not responded to their inquiry, Would have changed hotels but was unaware of bathroom issues until into the night - and had an early flight. We've liked other BestWesterns - this one was awful. Corporate now offering a 50.00 voucher but I'd really prefer a refund. Unrealistic, I guess - but I'd be wary to book this chain again so the voucher would be worthless. At least with a refund I could report issues were resolved to my satisfaction -- which says a lot about a service industry. Dear Madam, We tried to compensate you in every way, you changed three rooms, no one was good for you. You received a voucher for a free staying, but the only thing you wanted was a total refund for a not refundable rate. Sorry but it is not possible, because is not our faults. We love dogs, dogs are welcome, they are more polite than some humans. Best regards. "A Tale Of Two Hotels"
I visit Rome regularly and usually stay across the road from this hotel at the (newly named) Mercure Leonardo Da Vinci Hotel - but as I had plenty of BW points, I decided to try this hotel out. We stayed here twice within a three week period. The reason for the stay was because we were flying into Rome from Dubai and the following day, we were flying out for Sardinia. On the second stay, we were doing the reverse trip. So, check-in was fine. We were given a room in the older section on the 2nd floor. It was SMALL and the air conditioning would not go below 25C - about 80F. There have been previous reviews regarding this issue and it would seem that the management chooses to take no notice of it. Some hotels can control the air conditioning from a central area, usually near reception and they can turn it ON for your individual room. This is a European thing and is not done in other parts of the world. I went down to the reception and the very pleasant lady said she'd "get engineering to look at the problem". No one showed up and the problem remained. Given it was only one night we just opened the window and let some fresh, cooler air in. On the return trip I was greeted by Francesco at reception. I told him about the previous uncomfortable stay and asked if we could avoid a repeat. He checked the system and gave us a new refurbished room on the ground floor near the swimming pool. It was excellent. Spacious and much lighter and brighter than the other room. The big bonus was that the a/c worked. Comfortable bed and big bathroom. Thank you Francesco ! Breakfast in the adjoining restaurant was very good and at only 5 euro a head, it's a bargain. Would definitely stay again - but in a refurbished room. For those new to Rome airport and wanting to get the hotel shuttle: walk out the door of the arrivals hall and turn RIGHT. Walk along as far as you can and you will see the tourist coaches and other buses on your left. The hotel shuttles pull into the smaller parking bays on the right. There is a sign up on the concrete pillars telling you what hotels are being serviced. "Much better than a typical airport hotel"
This two storey hotel is 10 minutes from the airport and has an extra charge shuttle service that is much less than a taxi! 6 Euros per person, each way; book it through the hotel if you need it ... not sure it runs all hours of the day but it did in the morning. (We did not book it to take us from the airport to the hotel and the Taxi Supervisor charged us 30 Euros; should have been 20 but such is life. The shuttle would have been 12) We spent 18 hours at this hotel. We had a small but nice and clean room, 111, overlooking the outdoor restaurant. (In 11 hours there were only three occasions when we obviously heard aircraft taking off. Slept through any others.) They have a gorgeous swimming pool with lounge chairs, a gym with equipment, and an outdoor seating area with umbrellas (see my photo). You can order drinks and food here during certain hours of the day when the restaurant is open. There is also a small bar at Reception where you can get alcoholic drinks. Breakfast is 5 Euros. Lots of variety. Good value. (We booked the room through one of the agencies we found via tripadvisor and they made it sound as if breakfast was included, but no. Still, the price was right.) There is a classy restaurant, Concorde, or walk to the street, turn left and there is a good Chinese restaurant about 250 yards away, Miao Xian, if you want different food. Delicious. Both are highly rated on tripadvisor. Most people probably just crash here for eight hours before a flight and never use the amenties, but we had more time so we did appreciate them. Dear Guest we really appreciate your feedback. Thank you for your visit, we would be glad to host you again. Best regards. "Not bad for an airport hotel"
Traumatized by a few airport hotel experiences in the past, I checked in with no high expectations. This one turned out to be a satisfactory overnight stay. The staff were friendly and efficient. The room was nice sized. The towels looked new and were clean. There was a coffee/tea service. Chamomile tea for a relaxing night cap in the veranda. The toilet/bath facility fits the overnight needs. The carpet did not look very clean but they offered bedroom slippers. They offer shuttle service at 6 euros per passenger per trip. The airport bound ride was more than 5 minutes late so suggest to allow extra time in your schedule. Note that hotel bound, taxi option is 25 euros flat rate from the airport. Note further that the pick up point is in Terminal 3 towards the very last parking slot which is a bit of a walk if you're coming from Terminal 1. Waiting time for the hotel bound shuttle is 45 minutes at certain times. Suggest to call for a seat reservation with the hotel as the shuttle bus has limited capacity. The hotel has a restaurant. Dear Guest thank you very much for your feedback. We are grateful for your appreciation. Best regards. Very nice airport hotel. Rooms are modern, very clean and spacious although the bathroom was quite small and crammed.. WiFi worked great. Staff nice and helpful. Shuttle service was great Recommended! Dear Guest we really appreciate your feedback. Your satisfaction is our priority. Thank you for visiting us. Kind regards. "Good value for money, clean and comfortable room"
Stayed for 1 night in late April, Reception staff were not that friendly upon arrival, however, the room was great, nicely furnished, bonus of having a kettle with tea & coffee. We felt that it was really good value for money and had the option of eating at other restaurants in the area as well as in the hotel. As it was we did neither because we were exhausted from the trip and went straight to bed. Dear Guest, By telling us what you liked about your stay and how we can improve, you are helping us deliver a superior experience for you and other guests in the future. I'm sorry for the welcome, please accept my apologies. Your satisfaction is our priority, thank you for your feedback. Best regards. "Great experience for a one night stay"
We stayed one night before a flight out of Rome. The hotel was convenient to the airport with a good shuttle service. The restaurant was great and included a sumptuous breakfast. The dinner was excellent. We were impressed with the whole experience. Dear Guest thank you for your kind feedback. It was a pleasure to had you as our guest. Best regards. Overnight stay here on route to Sicily. Quiet location but clincher was the Resturant. Amazing first meal in Italy. Amro and his staff very friendly and attentive. Great food at a reasonable price. There are lots of alternative places to eat in the town but we are pleased we decided to eat at the hotel. Resturant is called Concord. Dear Guest your satisfaction is our priority. Thank you very much for your feedback from the entire staff. We hope you will come back and see us again soon. Best regards. "Cleanliness and hot water issues"
Two basic things a guest expects were not delivered: I never had hot water in my room and I took a very cold shower the night of my stay. I also had to advise staff to change the sheets as there were hairs on top of the covers and in the bed. This is not acceptable, even though a porter kindly changed the sheets. Staff was nice and apologetic, but when I emailed the manager I never heard back. Again, not acceptable. Too bad because it would otherwise be ideal for a quick stopover for landing/departing Fiumicino. Dear Guest we really appreciate your feedback and we hope to see you again. Best regards. Dear Guest we really appreciate your feedback. Thank you for visiting us. Best regards. We stayed here our last night after touring Tuscany. It was great, they had a shuttle into rome for a minimal charge, also they had free parking, so we were able to leave the car and just return it in the am before our fight. Very close to airport, only about 10 minutes. Clean, good restaurant, good breakfast, and everyone wes extremely accomodating. It was great. I highly recommend it, especially if you're just coming in for a cruise, or heading off to somewhere else, it's perfect for that first night, or that stop before going home. "This was a convenient chain hotel." Our ground floor room was easily accessible from the car park and the reception was efficient and allowed a late check out. The hotel has a Shuttle to the airport and train station and were very helpful with information and time tables.Breakfast was a standard but the grounds and outdoor eating area was quite pleasant. "About $100-you get what you pay for. I would not stay here again. " My friend and I had an early flight out of FCO Rome, Italy. We decided to choose a Rome airport hotel for our last night so we would not have to wake up at 3am to travel from Rome to the airport. Since we had an excellent experience with the Rome Best Western Universio, we decided to use this hotel chain again. The staff here is excellent and caring, but are limited with what they can do to help guests. They do speak and understand English, which is nice. Now with the bad. The first room I was put in smelled strongly of body odor and was very hot. It's April so the weather is 70 degrees during the day and 50s at night. The windows open, but we are at an airport. They moved me to another room immediately and told me that the air conditioning had not been switched on yet. To open the windows. The room was over 80 degrees and still smelled a bit of body odor but it was tolerable. I opened the windows to let the room cool down and was serenaded by hysterically barking, yowling dogs and screaming jets. Turned on my wifi to watch a Netflix movie-too slow. Turned on tv, no English channels. This makes a very, very, long night. "Just about okay for a night"
Parts of the hotel have been remodeled but the building we stayed was not... it does have a nice little pool to relax before or after a long flight. For the $ around $90 Euros..the place is clean and convenient. Everything you'd want from an airport hotel. Close to everything, clean, and decently priced. Camelia and Stefania from the continental breakfast buffet were very pleasant to talk to. Also, you get free parking. :) Overall exactly what i wanted from BW. Consistency! Dear Guest, thank you for your feedback. We really appreciate your visit. Best regards. Arrived late into Rome, Italy. Booked a king size bed room on line. Pleasantly surprised with the accommodations, room included large jacuzzi tub, breakast included in the price (buffet). Francesca, Monica and Cinzia were awesome at the front desk! Dear Guest we really appreciate your feedback. Thank you for your visit. Best regards! "Good for business, close airport, restaurant, swimming pool"
"Everything as good as before"
It is so easy to stay a night before the return flight from FCO back home. Once again everything was as good as always before. All the staff so kind and smiling! Next time I shall overnight arriving to Italy and then next morning with clear eyes and after having an abundant breakfast I am happy to continue my trip to the southern Italy. Late arrival 10 min with taxi from the Airport (20€), but the staff was still friendly, helpful and competent. Tooth brush received for free after luggage did not arrived. Possible shuttle bus option from and to Airport for 6€. I was quite surprised by the Breakfast as there were lots of choices. Having my flight at 6 am i stayed one night in this close to the airport hotel. The room was very clean and comfortable, quiet and functional. Real good price. The stuff was very friendly. I would recommend it to everyone. Dear Madam, thank you for your kind feedback. We hope to have you again as our guest. Best regards. Very friendly and helpful staff. Ideal if using shuttle bus or own vehicle but parking isn't obvious when you enter the property. Best to use the street address for satnav. In the rented Citroen the nearest Best Western is shown about 2K away but fortunately routed me right past it and I was paying attention. Restaurant closes at 1030pm but I was made welcome at 1015pm after working up an appetite on the stationary bike in the small gym. Price very competitive with alternatives and would stay there again in similar circumstances. "Great hotel by the airport"
Great hotel located near airport with shuttle service to airport. 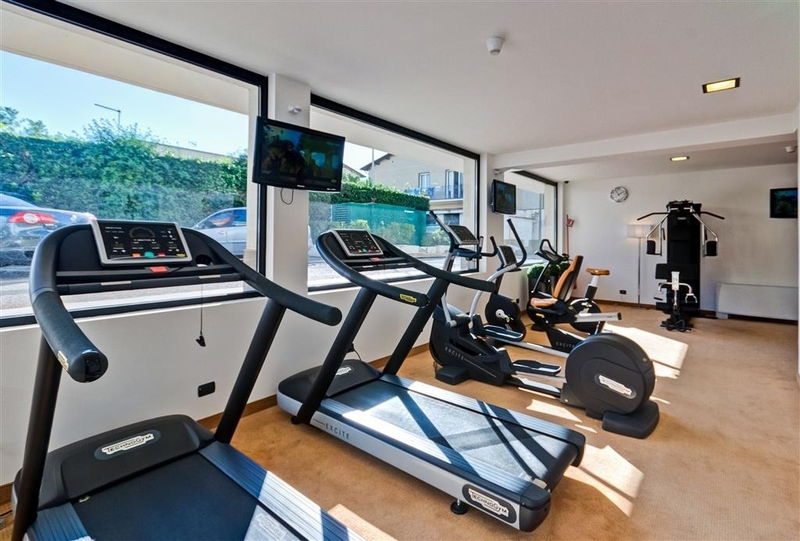 Very clean and modern, with a restaurant and bar and a fresh water outdoor pool for relaxing along with a fitness centre. Modern mid size rooms with WIFI and sound proof so you don't hear the planes. Friendly staff. My wife and I stayed at this hotel for one night only. The hotel provides a fee-shuttle from the airport at set hours. The hotel is situated in an off-site somewhat run-down area near the airport. Reception was friendly and efficient. Room is very simple really suited for a one night stay and no more ... however clean and quiet. The breakfast was better than we expected with something for everyone. Would recommend for someone who only needs a short, inexpensive overnight stay near the airport. "Very convenient and good value"
Used for one night before an early-ish flight. Room & facilities were clean and functional. Plenty of choices for breakfast. Not a major issue for a one night stay, but the bar is in corner of the foyer, so no cosy place to relax with drink. "A gem of a Hotel with a 5* team of Roberta and Andrea to welcome you and book you into your rooms"
This hotel is very conveniently located less than 10 minutes from the airport. The welcome and booking into a room is a very pleasant and easy process with Roberta and Andrea as they speak perfect English, greet you with a smile and even allow you into your room early without the mention of the normal extra charge that most hotels charge these days. The two hotel rooms that our party was allocated are both very clean and in good order with all that you would expect or require for a one night stop over. The WiFi is free and very fast which is a real bonus. The hotel was excellent value for money. So, if staying near in the area I would suggest that all in all it's one of the best on offer and I I wrote earlier great value for money and ticks all the right boxes. "Very close to the Airport, but beware...."
This Hotel is about 10 minutes from the airport, but if you take a taxi it will cost you €25. Which is outrageous, as a trip to central Rome, 45 minutes is €50. The hotel has a shuttle which you would need to book ahead, depending on the time it is €8-10/ person. Some of the Hotel has been renovated, but although the beds were okay, if you get one that has been renovated, the carpets are filthy. The unrenovated rooms are not fun beds have big dips in them, way over due to be replaced. You can hear the planes landing most of the night ( hence, close to the airport location. Some of the staff are outstanding, others indifferent. The night I was there the restaurant staff were just great. I didn't eat there so can't comment on the food quality. 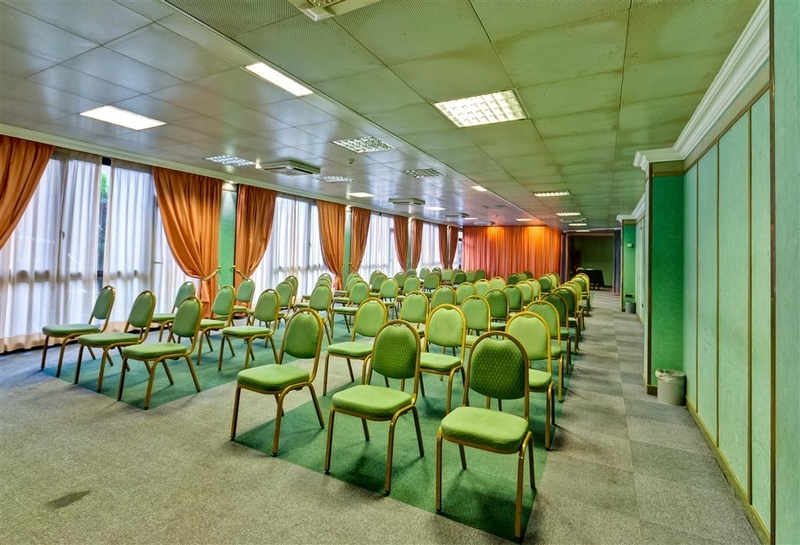 "Great location but tricky shuttle and questionable cleanliness"
Perfect for an airport Hotel. Shuttle service was tricky, we didn't know how to get the shuttle to the airport. So we took a taxi and they ripped us off, flat fee of 25 Euro (twice as much as the shuttle). We took the shuttle back to the airport for only 6 Euro each. Cleanliness of the room was poor. The sheets were new, but the bathroom trash wasn't emptied and there was dog hair on the duvet. Made me weary of what else wasn't clean. Walking distance to GREAT restaurants. We were leaving Rome on a morning flight and decided to go up the day before (from Naples) to make it easier. The room was comfortable and quiet (despite being in the flight path) and the complimentary breakfast was great (many American favorites). Convenient shuttle (running every 20 minutes) to take you to the terminal. We checked in after a long tiring flight. We were given our room key but the maid was still cleaning the room. She called the front desk, then lead us to a different room. This room was a much smaller room than we booked. I went back to the front desk myself while my wife waited in the room for me to return. Meanwhile another couple walked into the room, told my wife this was the room they were given would she please leave. When I returned with a different room, we found the room to smell of stale cigarettes and the towels were worn and had holes in them. They charged us for breakfast the next morning which our reservation clearly states breakfast in included. When I went to talk to the manager he said he was trying to accommodate by allowing us to change rooms three times. It was Best Western's mistake about the breakfast charge, it was not included in the room rate. And he stated that they have very strict quality standards about their linens. They are very defensive and not accommodating at all. I do not normally write this type of post, however when they turned this around on us to make everything our fault I decided to let everyone know this is not a good airport hotel to stay. There are many other hotel in close proximity to choose from. We still have not be reimbursed for our breakfast charges after 6 weeks. "Good room, an ok price, ok service"
The stay was good, the shuttle driver was nice, but they took to long to pick us up to and from the airport. The room was good not to good a view from the window, but the bed was very comfortable. The front desk lady was not so nice at check in, she wasn't very rude but she had a bad attitude when asking her a question. I did enjoy that there was a restaurant down stairs to grad dinner before relaxing and going to bed after a long day of travel. The restaurant was great, affordable, and friendly staffed. Our stay at the Best Western Rome airport was really nice. At the end of our long trip in Italy, it was a relaxing experience. The staff is very nice and the restaurant is very good. Rooms are very comfortable. "Close to airport - but not a 4 star hotel !" Pleasant and helpful staff but WIFI NOT working. Hair Dryer not working. Room small. Restaurant overpriced and poor selection. Airport is close to hotel but had to pay 20 Euros to hire a taxi to take us to the airport. This is unheard of for an "Airport Hotel" ! "Good location for getting to airport and eating out in Fiumincino"
Everything you might want in an airport hotel. Clean, quiet, and comfortable - friendly staff and a good restaurant. A shuttle (6 euros/person each way) will take you to or from the airport. If going to the airport from the hotel in the morning, make your shuttle reservation the night before. The hotel looks very nice but the people that staff the hotel are not nice. They are brusque and unhelpful. The bathroom is so small that the door will not open past the sink. The air conditioner was not running very well so we took the front panel off to look inside and it was extremely dirty. It made me worry about the air quality. There is another Best Western hotel in Fiumicino. Best Western Riviera. It does not have a pool but it is in a nicer part of town walking distance from the beach and also offers a shuttle service. "Mikes Rome Airport Hotel Review"
stay for 1 night was o.k. Just the noise of landing planes is a bit problem at night. service is good, transfer to airport costs 6 Eur for person, but on the street 5 min. walk there is a public bus station taking to the airport (tickets may be baught at tabacco shop or just ask the driver). I had a chance to visit overnight on business and found the staff, service and amenities to be good. As expected in a larger European city the food and services were very good the other (gym facilities) were clean but smallholder and hot! I enjoyed my custom pizza at the resto, service, prices, and atmosphere were reasonable and pleasant. Quality that other come to expect from Best Western hotels. I would recommend taking the shuttle from the airport rather than the 25 Euro city taxi. "Good service from some of the man in the reception"
We've stayed in this hotel many times before. Because we have been satisfied. This time we got a small room with garbage cans below the veranda. yuk . The room was very small. Couldn't neraly bring our suitcases. Thanks to a young man in receptionen did we switched rooms . There were two men in the reseption , one should find another job. the Breakfast was lovely with nice staff. The hotell are Located just 5 minutes from the airport and hotel bus shuttle costs only 6 euros per person. If yuou got a nice room this hotell is a fantastisk place to stay. "Decent stay at the airport"
This hotel is convenient for an overnighter before an early flight. I found a great rate online, which is why I chose this Best Western. To get to the room I had to go outside and down some stairs (help to carry my bag was offered). The room was small and dusty but adequate. The TV, on a shelf over the desk, didn't work, but after getting on a chair to discover the problem, I found it simply wasn't plugged in. I didn't eat in the restaurant or order from room service, but the menu offered looked appetizing. The minibar was well stocked. There is a shuttle to and from FCO airport at the rate of 6 euros each way, but no tip to the driver is expected. The shuttle is found in the furthest bay, #26, which is quite a walk from the terminal but is under cover. The hotel staff was good. "Check the airport shuttle to the hotel before booking"
This is the little hotel that could. It is a €20 taxi ride from the airport, but they do have a shuttle. It has a cute pool and room service and a restaurant. There is a good Chinese restaurant and pizza place across the street. If you rent a car from Autoclick it's right next door. The rooms are clean and updated. The staff is friendly and helpful. The breakfast is good and comes with the room. There is parking available and free. 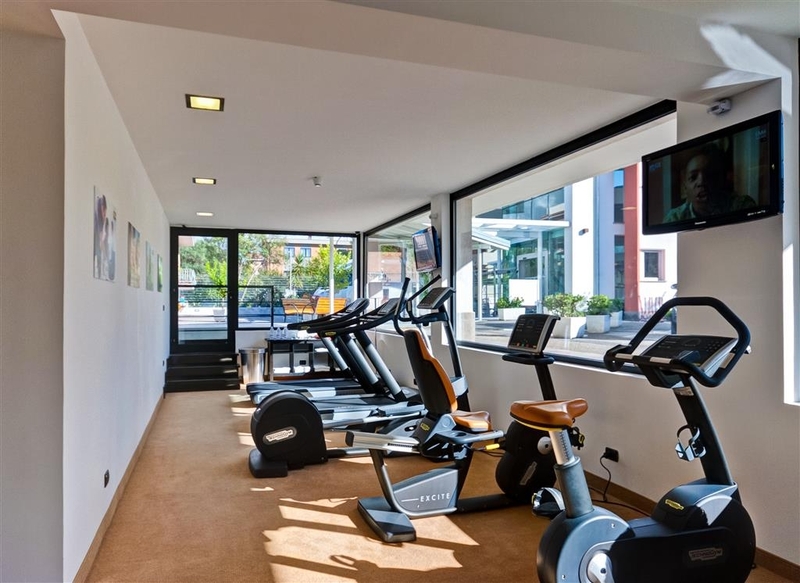 You can rent bikes too :) There is a gym on site in case you are an overachiever like me. "Great for a stop over "
Stayed here overnight, arrived quite late and had an early morning flight so it was the perfect location and close to the airport. There is a shuttle bus that runs from the airport but be warned the last bus is at 1030pm so we missed it. The bed in my room was massive and so cosy. Air conditioning in room excellent, although I turned it off as it was making me cold. Was impressed with the Great selection of free shower gel, creams etc.. The airport had lost our luggage so I was so grateful and happy the hotel provided these, as most budget ones don't. I'd stay here again, excellent choice. Spent 1 night early flight next morning. Grata location with ALL amenities:Restaurant , outdoor pool , fitness center etc. Shuttle to and from airport which was great for our 8am flight. Room clean but a little small. Excellent service from staff. Only negative point I had to book 2 rooms coz don't have many family rooms for 2adt+2kids. Highly recommend for airport hotel. "This Place is a Dump!" Carpets in rooms (we had to try 2 rooms trying to find an AC that worked properly and struck out both times) - were filthy and stained. Neighborhood is sketchy and appears very unsafe. This is more that a Super 8 Motel in the states - adjust your expectations accordingly. The hotel room and breakfast was decent; There is a hotel shuttle but the schedule is not available online therefore I had to pay 18 euros to get to the hotel from the airport. Also the bar ran out of beer before 11 pm. "Breakfast was the only good thing"
Itty bitty little room (my knees hit the shower wall if I sat on the toilet and the bed nearly touched the walls) with an air-conditioner that didn't work assured that we bailed on the rest of our reservation and found somewhere else to stay for the rest of the time. Breakfast was good though. 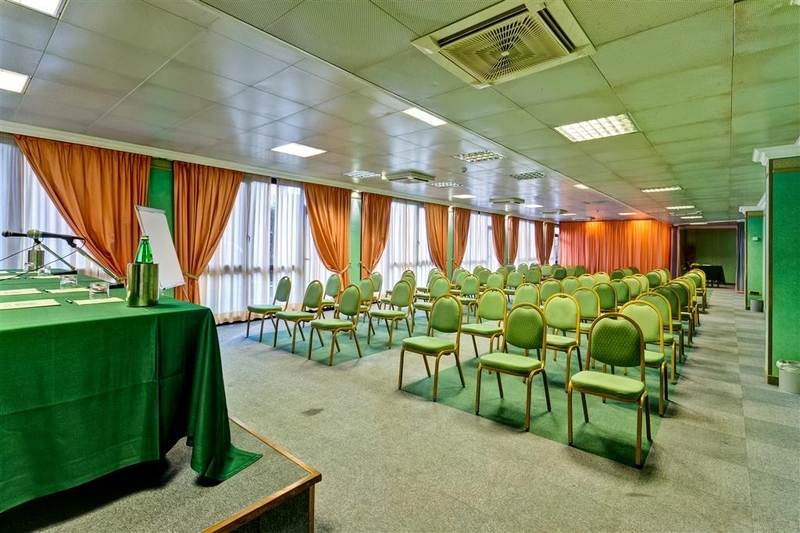 "Comfortable hotel close by Fiumicino Airport." For a comfortable, modern room, extremely close by the Fiumicino airport, Rome, The Best Western was a good choice. I chose this hotel because of its proximity to the airport but I also chose this hotel because of the reputation of the Best Western brand. I've stayed at a few Best Westerns in the U.S and have always found them reliable for cleanliness and service. Even though this particular hotel at Fiumicino was independently run, they did have features that Americans and other travelers to the American sites will be familiar with. They had a pool, an exercise room and ice machines. The one big difference was the restaurant. To my pleasant surprise, the restaurant was semi-formal and served Italian food. I enjoyed an Italian meal, in a calm atmosphere and was served by a waiter who was very polite and professional. The front desk staff at the hotel were also polite and welcoming, though I did have to have them confirm that my hotel stay had already been paid for. At first they were under the impression that my bill was still due, despite my having prepaid the bill several months ago. My bedroom was all that I could have asked for. I requested a non-smoking room and I got it. The standard room with a queen bed covered in masses of clean white pillows was a welcome sight for someone who'd been traipsing across the countryside by train all day. They had all the usual amenities like air conditioning, a big TV, a closet with a safe, a bar fridge, facilities to make coffee/ tea and so on. The bathroom was spotless and sleek. The one blot on the landscape was that the carpet leading to the door was a little spotty and in need of a steam clean. The other issue which was perhaps related more to the airport than the hotel, was the shuttle bus service to the hotel. On the Best Western website under the Map/Directions link there is a reference to the hotel shuttle bus service which leaves from bay number 26. This description needs more elaboration. When I arrived at Fiumicino airport I thought I'd be able to find the shuttle bus easily, but to my dismay ran into dead ends. It seemed like no-one the airport knew where the hotel shuttle buses departed from and there was no explicit signage at the airport either. Finally I talked to a lady who sold tickets for the coaches and she correctly directed me. I should have contacted Best Western initially on arrival because when I called they confirmed that the shuttle bus was at Bay 26 at the Arrivals section of T3 terminal. Basically you need to be at T3 on the Arrivals level. Walk out and turn right. Keep on walking till you see a bunch of large coaches. These aren't your shuttle bus but you're close. Look on the back wall behind the buses for a tiny blue sign that says 26. Below that you'll see a small plaque advertising the hotel shuttle with Best Western among other hotels mentioned. The shuttle timetable was also posted. The buses themselves were not marked except with a generic sign saying “Hotel Shuttle.” Remember to ask the driver to confirm they're heading to the Best Western, because not all the shuttles do. No need to pay the driver, as the hotel bills you. The trip to the hotel was short and at 6 Euros each way, was a lot cheaper than a taxi. Also, once at the hotel, pre-book your shuttle back to the airport as they get booked up fast. Overall despite the hiccup getting to the hotel via shuttle, I would recommend Best Western, Fiumicino. I am not sure I would rate it with 4 stars if I had to pay for it but I didn't as it was paid for by Etihad due to their flight being late and us missing a connection with Alitalia. There is a shuttle to the hotel which was free for us but it is not free usually. It seems to leave every 15 minutes from the airport from stand 26 by terminal 3. You really have to book the shuttle for your morning departure as it gets quite busy and you might miss a spot. The reception staff were very pleasant and as the lift was not working our suitcases were kindly carried by one of the employees. The room was not big, small single beds, small bathroom with few amenities and also a balcony and fortunately a working AC. TV had very limited number of channels in English but some more in Italian, French and I think in Russian too. We had a dinner at the hotel restaurant which was nice and also a buffet breakfast which was even better, the chocolate croissants were worth the flight delay according to my daughter. There is absolutely nothing to see anywhere near the hotel but I presume it is an airport hotel more than anything else. To avoid morning and holiday traffic and the usual stress of arriving on time for an international flight, the obvious answer was to find a hotel close to Fiumicino Airport. Best Western Hotel Rome Airport was the solution. After sitting in traffic for hours due to an accident, we arrived at BW, greeted with smiles by Cinzia and Julianna who were most accommodating with their customer service. Within minutes we were checked into our rooms which were clean and modern with comfortable beds for a quick nap before wandering a few blocks over to walk along the waterfront filled with sailboats and fishing boats. Enjoy an aperitif or snack at a local bar, meander through the bazaar of vendors, then take your choice of restaurants along the wharf for the freshest of seafood. Hotel Breakfast in the morning was filling. Check out was a breeze. The hotel offers shuttle service to the airport which is 15 minutes away without traveling on the autostrada. Comfortable convenience, indeed. "seedy area, bad communication, but ok hotel"
The sign showing where and when the shuttle runs is only at the front desk. Not a convenient location when you are sitting at the airport waiting for it and can't get anyone to answer the phone for 30 minutes. It would have been good to have this info on the website or at least in the confirmation email. We ended up just taking a taxi. The shuttle does cost 6 euros a person (which they waived for the trip back to the airport since we had to take the taxi to them) but it runs every 20 minutes. The pick up is at the end of terminal 3 for those who need to know in the future. Not sure about T1&2. The air conditioning in the room didn't work and the wifi was horrible- only one bar so very slow for data and unable to make any phone calls using it. The neighborhood is terrible, it felt very unsafe. We only stayed here for our overnight layover, otherwise we would have found somewhere else. It IS very close to the airport though so it is convenient if all you are doing is staying overnight to catch another flight. The good things about it- nice pool, beds were more comfortable than many others in Italy (seriously- most felt like sleeping on plywood, at least these had a LITTLE cushion). The best thing about this place was the restaurant- it was fabulous food and great service. Breakfast was included for us and had a nice selection, including american bacon. Within 2 miles of the airport so convenient if all you have is an overnight layover. "Good visit if you are just passing through the area"
Generally everything was pleasant and no complaints. The staff were helpful and friendly. Its not the most dashing hotel you'll visit but it gets the job done. I was very pleased with the breakfast. Hallways had a bit of a stale, stagnant smell but room was cosy enough. "Air Conditioner doesn't work, Small standard rooms"
Even in the rooms where the AC works, it doesn't really work. Be prepared. Also the 'standard' size rooms are the size of the matchbox so book a junior suite if you are sensitive to extremely tight spaces. Neat and tidy airport hotel. Rooms on the small side but generally find this with airport hotels. Nice pool area. A number of little restaurants right next door - recommend the Chinese restaurant, it was awesome. Good service at reception. Would stay here again. This may not be the flashest hotel in town but the rooms are clean and have everything you need and it is very close to the airport which is great when you flight lands late in the night. The breakfast was lovely too. The hotel is well suited as a transit hotel prior to flights from Rome or as a stepping stones to other part of Italy. Its location serves well for catching the bus and coach services to other parts of Italy. with a cheap transfer service to and from the airport. The hotel itself is good with a nice breakfast. We also ate at the hotel and had a very enjoyable meal and wine. Rooms are good. Good airport hotel. Shuttle bus to/from airport very convenient €6 per person. Tea and coffee making facilities in comfortable room. Good breakfast. Would recommend for an overnight stay close to airport. "Great hotel near airport "
Enjoyed our stay at this hotel. Close to airport and perfect if you have an early morning flight out of Rome. Room was clean, staff helpful and the restaurant was very good. Pool area was small but the music playing poolside was relaxing. Would highly recommend this hotel. "Everything about this place is bad. Worst reception staff EVER!!!! " I'm struggling to say anything nice about this place. I picked it because it is the closest hotel to Rome Airport and we had a very early flight. BIG MISTAKE! I've read some reviews that say it's great, I have to disagree and I always try to find a positive about a place, I just can't find one here. The daytime reception staff are RUDE RUDE RUDE, it's almost like they get a kick out of seeing how rude they can be. Do not book this place if you are arriving early.. They have the STRICTEST no early check in policy I have ever experienced. The rooms are tired. The walls are paper thin, you can literally hear EVERYTHING. From the restaurant (people talking loudly over dinner) to the lifts to the Planes that SERIOUSLY SOUND LIKE THEY ARE GOING TO CRASH INTO THE BUILDING! The Windows actually shake. The rooms are seriously hot, unable to get it even a bit cool. It was very clean do they at least have a good cleaner. Don't be fooled by the fancy looking lobby, it's the nicest part of this place (except the staff) but unfortunately you can't sleep in the lobby. The minute you leave the nice new modern lobby you go straight into a tired drab world. Thank god we only had one night here. I stayed at the Best Western overnight to be near the airport. The hotel staff is warm and welcoming and extremely accommodating. The rooms are clean and updated. The breakfast was nice with typical Italian style foods (pastries, etc). However, I am gluten free. Although they did not have much food, they did bring me some packaged gluten free biscuits to have. Overall great hotel! "Nice hotel for a one-night stay"
Stayed here our first and last nights in Italy and found it to be comfortable and quiet. Great bed, tiny bathroom, but just fine for a short stay. Be sure to ask for a top floor room for maximum quiet. The staff were friendly and gave us directions for returning our rental car at the airport (follow signs for Terminal 5). Breakfast was more than adequate, and although we had to pay, it was only 5 euros apiece. For dinner, we found a nice restaurant a short walk from the hotel (turn left out of the hotel, walk past the bar, and turn left onto the first side street). We would certainly stay there again. "Excellent hotel for an overnight near Rome airport, with a few caveats"
My family stayed here for an early morning flight, in a family-sized room, for a night before leaving from the Rome airport early. The room was spotlessly clean with basically all amenities, and the service was exceptionally strong, better than anything we had experienced in Rome. I wish we had come here to go to Ostia Antica, actually, as they can easily help with this (we tried, but it was too late in the day, and too hot) -- contrary to all info we found online, very cheaply and by bus. So I recommend it for this as well. I appreciated the nearness to the beach too, and the excellent restaurant across the street (I do not know the name, but it is directly across and slightly towards the beach, less than a half block away, and makes fresh pasta and sauce -- this had the BEST pasta I had in two weeks traveling through Italy). It was frustrating that the shuttle didn't come all that early and we wound up taking twenty minutes to the airport, for a cost, when we could have just stayed near Termini and taken the Leonardo Express, which takes a half hour, but does cost a bit more. The beach nearby had a lot of character and was breezy with a gritty vibe to it and lots of families, not anything at all like Rome with some liquor shacks that reminded me a bit of Jamaica where we enjoyed local color and inexpensive drinks. So I found it interesting to see another side of Italy. And I was very pleased with the hotel. Breakfast buffet was HUGE and generous all around. Not a luxury hotel because not in a luxury area, but certainly one I can recommend if you happen to be in Fiumicino, and again, I say instead of staying for just the airport, try going to Ostia Antica early in the morning by bus: the front desk will explain how, and it will help beat the heat in summer. "Perfectly fine for airport overnighter"
Tourist class hotel, 5km from airport. Everything works. Staff very proficient. Rather small room (standard room) with very small bathroom. Good free WiFi. Adequate basic breakfast buffet at 5€, quality so-so, coffee and bread merely acceptable. shuttle service from airport only runs about 15 times, between 12pm and 1030pm. too far to walk, roads not for pedestrians. Taxi is 15€ at daytime, 25€ at night. I would come again if needing airport stayover. Hotel was nice but our room smelt slightly musty. The room was a little bit cramped for 3 people. The shuttle bus is chargeable at €6 each one way. The restaurant was nice authentic Italian food but not all staff understood English. Breakfast was included but when we went down there was no hot food left. "Disappointing stay night before flying out"
We booked this hotel for its proximity to the airport and if that's all you're looking for, it is only 10 mins away. However, the second we walked into our room, it reeked of smoke. The room looks dated. Carpet needs to be cleaned. I can't wait to leave this place! This hotel was very close to the airport and convenient with the shuttle bus service. We were having a one night stay before catching the plane home. Breakfast was bountiful, staff friendly and room spacious and clean. "This is not a 4-star hotel"
Tiny rooms with dingy carpet that needs to be replaced. This is not a 4-star hotel and is overpriced for the quality. We stayed in a room with three beds, and the third bed was a springy camp style mattress with regular linens used to semi-disguise this. We could also hear the planes from the airport clearly in our room. I would not stay in this hotel again or recommend to others. "Nice basic hotel for a quick stay"
The hotel was really nice, clean and modern. We stayed there for one night and it was a good hotel for that. Staff was really friendly. We ate at the hotel's restaurant. The staff there was really awesome. Pizzas were good. The breakfast was also good there. There was a pool also but we didn't have the time to try it. Fitness center looked small but nice for a little work out. The hotel is basically middle of nowhere but it has all you need for a quick stay. Airport shuttle was 6e per person one way. "my last stay at BW"
Excellent Service from Roberta and Alessandro from Front desk office . I know them so many years and that is one of the reasons I return to this hotel when I am in Roma . Hotel is very close to Airport and shops nice walking area . "Not ideal if you want flexibility...or a smile." We arrived just before 1000 to find that there was absolutely no flexibility in the posted check-in time of 1400, despite requesting an early check-in with our original booking, and holding Diamond status in the Best Western Rewards program. I have never seen this at any other Best Western location, or any other hotel for that matter. Most places do try to accommodate their guests if possible. But we waited patiently for 4 hours, with not even a trace of a smile from any of the three front desk clerks. Our room was small and the TV half the size of my computer monitor (and not much bigger than the lamp shade!). The bed was very hard, but the bathroom reasonably spacious and clean. The Guest Information binder was torn, dirty, and many of the pages were falling out. Despite the scarce contents, the binder rings were too big to fit into the sole, shallow desk drawer. No writing instruments were in evidence, but cutlery was cheerfully delivered on request. The front desk clerks in the evening were much more friendly and helpful. We were not disturbed by any noise from the airport at night. The breakfast was passable but the strange colour of the scrambled eggs a bit disconcerting! Still, the coffee was okay and the fruit refreshing. The host in the breakfast room was not very welcoming, however, and I wondered why so many of the staff were so unhappy. Although we were tired and hot, and would have welcomed the ability to take a shower before the afternoon heat, I was shocked to discover that this was not an anomaly. Although most of the rooms on our floor were cleaned and ready before 1100 hours, no early check-ins were allowed: not even the exhausted couple with the overtired baby who was crying loudly! Not a pleasant atmosphere in the reception area, and for that reason, we won't return. "Nice Hotel close to Airport"
The hotel is simply adequate for a stopover when using the airport. The hotel does have a shuttle bus to and from the airport. Pick up is located at bus park at Terminal 3. I think it is slot 26. Breakfast is good. Rooms and bathrooms are small. With a connection the next morning this hotel looked ideal. The first option was the Hilton which is connected to the airport, but then I realised I could pay for the Best Western hotel with points. The price of this hotel is much cheaper than any other closer. A taxi from the airport can't be anymore that 3-4 minutes and costs 7 Euros + 2 Euros for luggage. Hotel shuttle service in the morning is 6 euro per person, so only 3 euro more, but You will need the exact terminal for reference. Check in and out was fast. The room was clean and the bed comfortable, with a good shower. Breakfast is enough and good quality. Room service was prompt with an extensive menu, only there wasn't too many snacks such as the regular club sandwich. The TV in the room is very small. This hotel is directly under the flight path so could be quite noisy for some, the windows were shaking at one point. There is a restaurant on site as well as pizza places within walking distance, less than a minute. Overall it was a great choice and I would stay here again. "Excellent for a night before flying"
I had a 12-hour overnight layover in Rome, I selected Best Western over the airport Hiltons because of price. I was not disappointed. While a bit farther away than the airport Hiltons, the ride was short and convenient - well worth the $100 savings. Space in the shower is a little tight but very much up to standard with normal Rome showers. Great stay, very convenient location to airport, staff is very helpful and nice, breakfast spread is incredible. Nice hotel, great pool, bar and restaurant. Located close to the airport, with shuttle service to the airport. Our only negative was the lack of wifi in our room. It seems the signal will not reach all areas of the hotel. Good location for the airport although too far to walk to the airport but the hotel have airport shuttle service at a fee. Very confortable and clean room. Plenty of space to park car. Breakfast was OK.
"Room is Ok but avoid restaurant"
Is close to airport rooms are OK, we had no problems with the shuttle. However, service not so good in restaurant. Avoid the eggs in the morning buffet, they are pretty rare but the other stuff was OK. Enjoyed the pool. Stayed one night the night before our cruise left port. Works well as it is close to airport and a short 45 minutes to the port in the morning. Nice outdoor seating at bar/restaurant. Also a few good place to eat within walking distance. 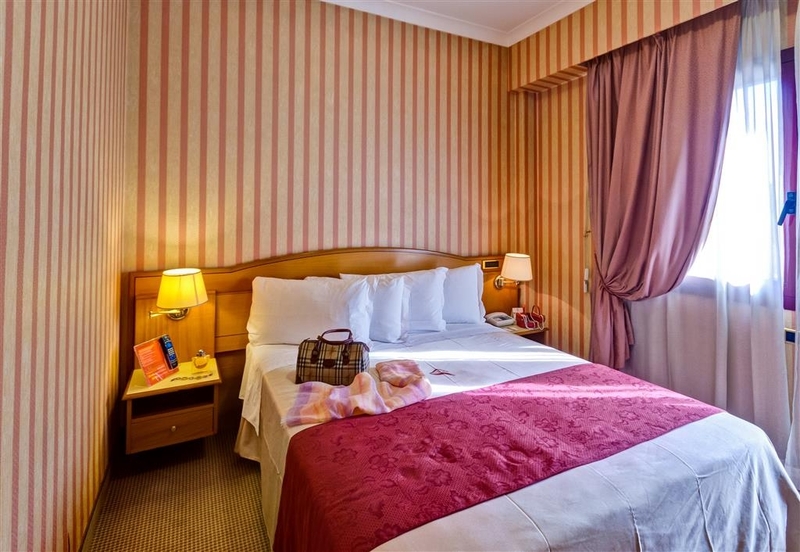 This hotel is both comfortable and well located for easy access to Rome's airport, about 15 minutes away by shuttle. A very good restaurant is located nearby, about 5 minutes walking. Prices are reasonable. Staff was friendly and helpful. Restaurant was delicious. We enjoyed the pool. The room was to small to be sold for 3 people. The 3rd bed was crammed in a corner and extremely uncomfortable mattress. The hotel shuttle to the airport was a plus. I booked this online through Aeroplan Rewards. Hotel has shuttle service for 6 euros per person to and from Airport. Runs every hour starting at 1300 from Airport to hotel and every 20 minutes from Hotel to Airport starting around 0600 but ending at noontime. Two stories with separate building for Reception. Small, shallow outdoor pool and exercise room. Wifi included. Electric kettle and coffee/tea service. Mini-fridge and some bathroom toiletries. We had two single beds and a cot. Jeepers but the beds were hard. Incredible included hot breakfast at adjoining Ristorante Concorde. Yappy neighbourhood dog barked through early evening and rooster started crowing at daybreak but no aircraft noise through the night. "This has changed hands since last fall"
We were here last September and were thrilled with the value: a 4 star hotel, spotlessly clean, gracious staff, superior food. But we are here now, May 2016, and it is none of those things, it is simply adequate. We should have first noticed when the front desk mentioned that we were no longer in their database because the computer system had been changed since we were here last. Don't get me wrong, it is okay, but just that, and still a pretty good value, but after how impressed we were last fall, it is a bit of a disappointment. Going to look around for something else next trip. Good position close to the airport. Hotel runs a shuttle bus to the airport which costs 6 Euro per person approx every 30 mins. Hotel is quiet but right under the flight path so some plane noise is to be expected as they pass by at a low level during daylight hours anyway, didn't hear any at night. My wife and I checked in late at night and were given a room only to find it was occupied when we entered through the door. Apologies if you was that young lady. We only sampled one room which I think may have been a family room as it had a double bed and another single in another room. Rooms have tea and coffee facilities and minibar. Decor was a bit worn but acceptable. Didn't get to sample breakfast as it had closed and I think we were there a few minutes before 10 am when it should close. I guess they thought no one else was coming. Breakfast was extra and I think 4 Euro each if it was taken. I would recommend for a night if you need to be near the airport. "Clean, comfortable & convenient - should be a * 4 rating!?" Overnight stay with late check out prior to pm flight. Had purchased an inclusive deal on internet that included breakfast - however - hotel's booking system had no indication of the inclusion. Problem quickly overcome. After making booking had difficulty in establishing airport pick up point for shuttle. E- mailed (after searching for address) to establish location of pick up point. Reply received, however, found reply in practice to be misleading. Upon arrival at hotel after some confusion at airport - found on check in desk simple - accurate - and easily understood directions for pick up point - clearly articulated on the counter. Why couldn' t that have been communicated? 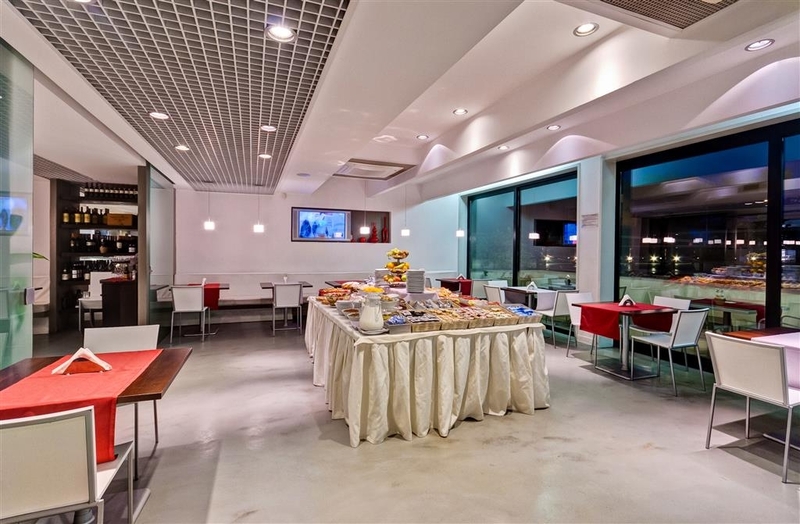 Convenient bar in reception area - good place to relax - after a couple of weeks travelling in Italy. Room 128 clean. Comfortable king size bed, ac working efficiently, good free WiFi. English TV channels and for the 1st time in travels in Italy, tea and coffee making facilities in room. Functional bathroom with some basic toiletries provided. Bathroom has a sliding door separating it from rest of room. Needed to use bathroom @ 1.45am to find that the door had locked itself. Fortunately no one in bathroom!! A call to reception brought a response in five minutes. Although young guy was a bit baffled as to a fix. However, with the aid of a coin managed to manipulate lock successfully. (Maintenance issue) Restaurant attached to hotel in our experience was very good, see separate * 5 review. Overnight stay ok, unnecessary maintenance issue marred what should have been a very comfortable visit!! "Nice overnight for early morning flight"
We stayed 1 night for an early morning flight. Nice clean room with good wifi. We were not aware of airplane noise. Shuttle to hotel leaves from Terminal 3 (far end Port 26/27 where busses leave). Regular early morning shuttle to airport. Total cost 9E/person I think. Pool was closed for maintenance. 10-15 walk to local town Fiumicino for dinner - seafood the specialty. Many places to eat. Little English spoken. We had one of our best meals in our 18 days in Italy -- different cuisine than elsewhere. We ate at Un Posto Al Sole #170 on TripAdvisor. It was "seafood takeout" meaning we ordered inside at sat at a sidwalk table (lots of tables inside too). It was Saturday night - the place was alive and bustling with the locals out to dinner. Shuttle service was prompt. Very convenient for late arrival in Rome. Hotel emailed details of their shuttle bus promptly and check in was friendly. Room was comfortable though modern, well-equipped bathroom was a bit cramped. We ate in restaurant but food wasn't brilliant and we thought it overpriced. "Overnight at Rome FCO Airport"
We took the train from Cinque Terre to the Leonardo da Vinci (FCO) airport and then shuttled over from from the airport to the Best Western. The BW was just great for an overnight. 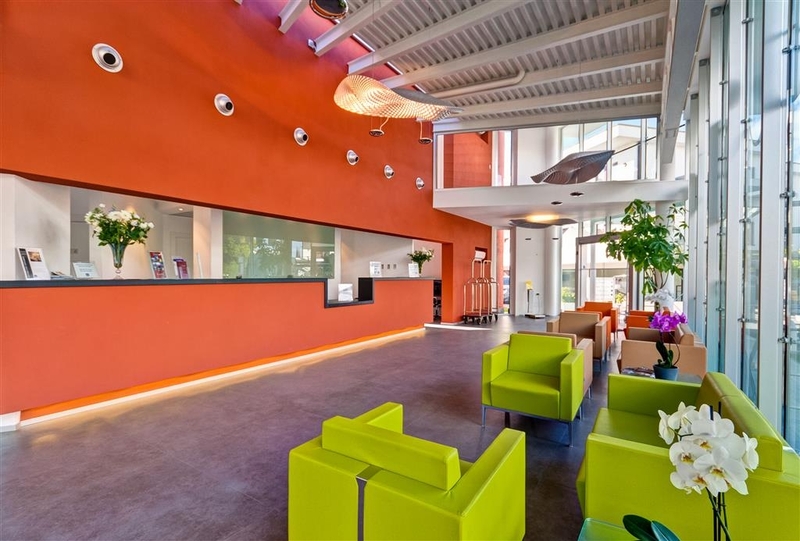 The reception is sleek and modern and very welcoming. The staff greeted we three weary travelers most promptly. Our room was a standard king and they added a rollaway which was helpful since there were three of us. The rooms have all been upgraded and nicely furnished. The wifi worked great for the three of us as did the air-conditioning. The bathroom shower stall was a typical European chamber that we found in the three places we stayed in Italy. The sink,toilet and bidet were all new upgrades as was the tiled floor and walls. In the event you must stay longer, there is a lovely pool and work out facilities on the well landscaped property. The restaurant on the property was an unexpected surprise. Again, the service was outstanding with a seafood and pizza menu. The also served a breakfast buffet in the morning. I would stay here again if ever in the area. "Shower for skinny people only"
Room was small, beds were ok at best. Shower was made for skinny people only. I am 6' 190lb and had about 2" to spare on each side. Room was warm with no air working. The restaurant was quite nice for both dinner and breakfast (which was not included). Closeness to the airport was a plus. "Great for the Airport "
We stayed at this Best Western on our last night in Italy and found it quite comfortable. First, the bed was large, the air conditioning worked well, and the wifi was amazing! We didn't eat dinner at their restaurant because it was rather expensive but the breakfast was wonderful with eggs, bacon, cold meat, yogurt, croissants, tarts, fruit, and cereal. The shuttle service is what drew me to the hotel but note it isn't free it is 6 euro/person something I didn't realize as I assumed it was free. To catch the shuttle from the airport to the hotel it is outside of terminal 3 follow the signs that say shuttle and then keep walking until you pass the bus station and you begin to see numbered parking spots, there is a Best Western sign! If you're planning on taking the shuttle to the airport make sure you tell them at check in as they reserve you a seat. The shuttle will also take you right to your terminal on the morning of your flight which was awesome because terminal 5 is separate from the other terminals! Overall, it was a decent hotel for a one night stay before a travel day although next time I would stay some place with a shuttle included for free. This airport hotel is located on the periphery of the airport, a very mixed use neighborhood not sketchy but little to walk to. Nevertheless, the property is very modern, an older part thoroughly remodelled and updated, and a newer constructed wing. We had rooms in both and were quite satisfied. The pool was closed for maintenance. There is a large outdoor patio area and fitness room. Depending on your rate breakfast is either included or separately charged (9E per person). Also the shuttle to/from the airport costs 6E each way per person. The Concorde Ristorante on the property is very good and busy at night. I've stayed (and been happy) at many european Best Westerns and this lives up to the high standard. group of 20 Canadians missed our Rome connection to Toronto, Alitalia put us up at this hotel which was very close to the airport. The rooms were comfortable as we were only staying the night, I like to say special thanks to Davide who served our grumpy group at 11 pm with a very warm welcome and at breakfast he treated us as he had known us forever. thank you Davide for you italian hospitality. "Great location and a very comfortable room"
The breakfast was fabulous, the room well appointed. Our stay was brief but very pleasant. The hotel and grounds are kept clean and neat. The staff was extremely professional. We were able to catch the hotel shuttle to and from the airport which made everything so much easier. 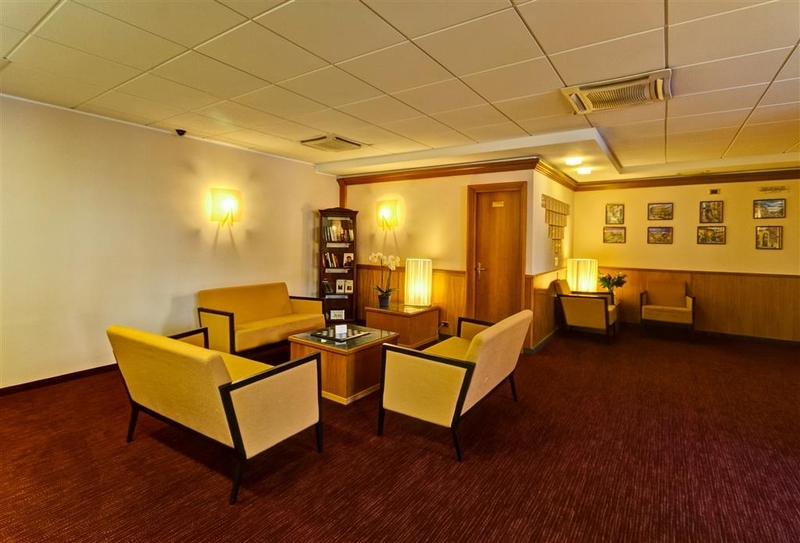 "Close to FCO airport for early international flight!" An American style hotel, good location. Free continental breakfast after 7:00 AM, but we have to catch flight and left for airport around 5:00 AM, so we did not have chance to eat. Restaurant meal costed around $30. Room charge $150 Free WIFI. Shuttle bus cost $6 one way. But the shower water is not hot and turn to cold sometimes. We reserved the hotel thru Orbitz and prepaid the room charge, but we were double charged again when we stayed in the hotel. Not a pleasant stay at all ! We are requesting to refund, if possible. This hotel was excellent value including a very good breakfast. Room was compact but adequate. The only thing which I did not like was the €6 cost each way per person for the short shuttle bus ride from airport to hotel. very good location to airport and to easy walkig distances to resturants. good enough for the price could have had larger tv very small laptop screen was larger than there tv. but good place for one night. Rooms were not fancy but beds comfortable. Ask for the remodeled rooms. Had a problem with air conditioning and hotel staff changed our room. Great pillows. Great breakfast. Amro Sharkawi, food and beverage manager, saw to our every need while dining for dinner at the Hotel Rome Airport, Best Western. (And breakfast too!) Dinner was very enjoyable, while I am guessing the locale restaurants might have a little better prices.) But if you are a weary traveller waiting to go home....this is a nice respite. Like others, we just needed a one night stay before leaving Italy. The room was just fine, although the bathroom was quite small. We are not large people, but we could barely use the toilet without our knees touching the shower. Minor thing, really. They have a shuttle (shared with two other hotels, apparently) that showed up when the sign on the post at the airport said it would. We didn't realize it would cost 8 Euro per person each way (most airport shuttles for US hotels are free). The best part of staying here was the EXCELLENT breakfast (included). Not just a pastry and coffee - lots of healthy and not-so-healthy choices. A nice way to start a very long travel day. "Well worth it, completely fine." Isn't it strange how experiences can vastly differ from one human to another? We arrived with a dash of trepidation, left with full blown, puffed up confidence. No doubt slightly heavier too, thanks to the little pizza family place (down a side street past the garage, it's name in twinkly tiny lights. Liza Minnelli ate there and prices slightly less than hotel restaurant, cheap and filling). Hotel-wise, bed great, room great, AC is set, but window opens ( we were 2nd floor, first bldg). Shower good, wifi strong. Airport a few breaths away (google their shuttle times if you want to align your travel times with this six euro pp one way service to and fro airport, as it runs only in the day). And the receptionist has Paul Newman eyes who found me an Italian adapter to charge my phone. What more do ya need? "Basic Accommodation With Disappointing Airport Shuttle"
Having arrived in Rome after a 16 hour plus flight, a friend recommended a stay near the Rome airport where airport shuttle service was recommended. Prior to booking The Rome Airport Best Western, I called the US Best Western 800 number which assured Rome airport pickup. Upon arriving at Rome FCO after a delayed flight, the Best Western Rome airport shuttle refused to pick me up and directed me to the taxi stand which demanded an expensive 25 Euro fare for less than a 5 minute ride to the hotel. Upon reaching the hotel, the front desk agent chuckled that its guests are often 'ripped off' by the airport taxis. He provided me with a basic clean room with bed, refrigerator, safe, poor air conditioning and a tiny shower which leaked water onto the bathroom floor. All in all, I would not recommend this hotel due to its lack of customer service. Needed a room close to the airport for our international return flight home after 2 weeks in Italy. Hotel was close, convenient and offered great Wi-Fi and very comfortable beds. Breakfast was included in the rate and was very good. This is my first stay at this hotel chain - 4 nights. I found the hotel very clean, quite and close to other restaurants or shops. The breakfast is great with lots to choose from. I will choose this hotel again if needed. "Good for what we needed"
This hotel is good if you are arriving extremely late or need to get to the airport extremely early. The staff was welcoming, professional, and understood clearly the necessity of getting to the airport early and on time. The room was a typical hotel room. It was clean with the exception of an incredibly stained carpet. The bath, while modern, was small to the point that it was easier to get undressed outside of the bath, or at least with the door open. The bed was comfortable and the soundproofing was good. We did not eat at the hotel. I believe that breakfast was served, but we left at 5 a.m. This hotel is a good choice for people who want to be close to the airport. It offers a quick shuttle service for 6 euros a person. The area is industrial and we didn't find any interesting restaurants closeby. However, the hotel retaurant is very good and serves a breakfast buffet that you can book with your room rate. The rooms are very small and were hot. We could not control the thermostat although we were able to turn it off completely. Breakfast service doesn't begin until 7:00 so it doesn't work well for people with very early flights. Overall, the hotel is adequate for a one night pre-flight stay. Perfect location for an early morning flight. good value. Clean and tidy and the wifi was speedy. I left before breakfast so I can't rate the restaurant. Taxi arrived on schedule at 4am so I was able to check in with time to spare. Very pleasantly surprised with this hotel. The rooms were clean and the staff were very friendly and helpful. It is a good value for the price. The breakfast was delicious and had a wide variety of food. The only thing that I was not too happy with was the shuttle. I don't see why you have to pay extra to use this hotel service. It is only a short 5 minute ride to the airport and it is easy to catch the Terravision bus into the city from the hotel. Overall I would definitely stay here again. We booked a night at the Hotel De La Seville because of it's proximity to the airport near Rome. Upon entering we were greeted in friendly manner and quickly shown to our room. The room was very clean and attractive. A bit on the smallish side according to USA standards but very comfortable! The bathroom had a large shower with a fabulous hand held or stationary adjustable head and plenty of hot water. The location is in a seaside community within a two minute walk to the beach. March is off season but there were plenty of shops and cafes open. The couple who own this hotel also have a restaurant and Roberto offered to drive and return us to their restaurant of the same name We had a fabulous dinner and really had an Italian experience! The bed was comfortable and the sheets soft. There was a beautiful. Complimentary l continental breakfast on the third floor with an ocean view. We were delighted with our stay and wished we had been able to stay longer. Room 257. Very little bathroom. Being a near the airport they might be ready to offer an early breakfast for early travelers. I know hotels that prepare something in this cases. But it seems too much to ask for this one. Below my expectations. Was on a standby flight out of Rome and needless to say I didn't get on so opted to stay somewhere near to airport till the next days flight, there is a shuttle from fco to hotel and is located in terminal 3 in parking spot 26 or 27 in hotel shuttle area it comes every hour starting at I believe 1 pm, it cost 6 euros, and the young man driver was very nice and friendly , the room was nice and updated with a nice modern bathroom, bed was comfortable, had a nice breakfast buffet with a lot do items to choose from even scrambled eggs and bacon, it is a short walk down the street to the ocean and a jetty you can walk out onto and a lot of nice seafood places to eat at, and a few confidence stores and also a nice bakery off the side street, there were a few nice looking hotels a little closer to the water if that's better for you, but this hotel was fine for a night or two, as I said it was very clean and modern, I had a good nights sleep and got the shuttle back to airport , short 5 minutes away. We stayed here due to a missed flight connection so wasn't a first choice. 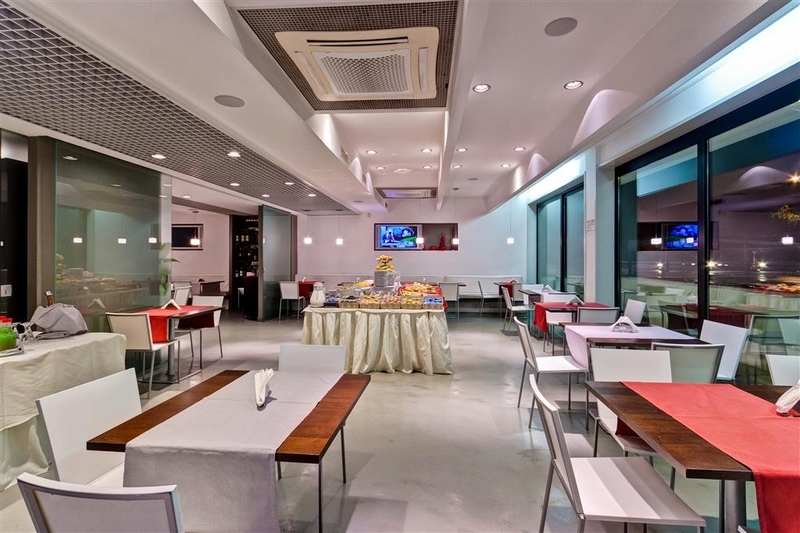 Location is perfect for adjacency to Fiumicino airport, the dinner in the restuarant was suprisingly good and the staff were attentive and kind. The rooms were clean and looked after but small and outdated. In need of a refresh. We booked here because we had an early flight the next day. On endeavouring to catch the shuttle from airport to the hotel, the driver would not look up from the game he was playing on his phone and responded very tersely to my enquireies so much so I turned and walked away; only to discover a little this was in fact the shuttle which of course had left. We caught a taxi which drove like a couple of kms and charged 25euro. The shuttle is 6euro each. On arriving at the hotel we complained about the shuttle driver but the receptionist (male) checking us in was not at all interested or sympathetic. After the checkin in we enquired about getting to the big shopping mall nearby. The receptionist confirmed there was one but had no idea when the shuttle goes. On asking another lady there later she said they do the shuttle booking for us. The first guy must have known this but couldn't be bothered doing it for us I guess. This all may sound trite, but when you are travelling in another country you rely on hotel staff to help. Basically we were very unhappy with the service there. Room was ok, but don't recommend this because of the staff. "Great value for rome airport"
I was pleased with this hotel having struggled to find a good hotel for a reasonable price near the airport. I got this for £50 for the night including breakfast and was pleased with the experience overall. The hotel provides a shuttle from the airport but beware that it has limited hours so check this first. The hotel has blocks so I was in a different block to the reception which was fine and i personally found it quiet, didn't hear any noise from the airport, one odd thing was that going into the block there are two staircases and you can only access some rooms from each so it took a while to work this out at first, could be better signposted. The room itself was very comfortable and had a good tv, very nice bathroom and even a balcony should you have wanted it. The breakfast was large and had plenty to choose from in the restaurant next door. Overall, this is very good value for fiumicino airport and i would stay here again. "OK for a night in transit"
We spent one night here before boarding a cruise ship in Civitavecchia. The hotel is old but well maintained. We arrived very late and were offered a handicap room. It was very small and it was almost impossible to get around the bed without banging into the chair or closet, for instance. The breakfast was acceptable if not the greatest variety. In all, an acceptable option for a night in transit. "typical BestWestern, nice extras, loud (next to the airport)"
this hotel is as the most BWs are: simple but cheap. Some nice extras here: very good restaurant (also for the breakfast), pool, etc. Would be good for family holiday - if there wouldn't be the airport. Sometimes you think the planes are going across your room (esp. early in the morning). Additionally there is nothing in that little village; except: the very best fishrestaurants you can find! And many of them. "Good Basic Hotel - Small even for Europe"
Having missed our flight from Rome to Budapest, Alitalia put us up for the night at the Best Western. It has a modern décor in the lobby and restaurant. The rooms are small. We laughed as we were going from here to a river cruise and were not sure which room would be smaller. It was clean, the WIFI worked and the breakfast and dinner were good. Basically, we were glad to have a comfy place to stay. We did walk along the streets and found a couple of places to stop for a drink. The room was so small and we had been in the airport so long we needed to stretch out. For a one night stay it was good. Quality experience when you need a good rest before flying. Room was clean and comfortable, staff service was excellent. Breakfast was more than ample. Shuttle to/from airport was efficient, but is at extra cost. "Affordable and Clean Hotel Near Rome Airport"
Best Western Hotel near Rome, Italy airport offers an affordable and good hotel to stay in. Staff in the front desk and the restaurant are very pleasant and helpful. The room is large, clean and well ventilated. The valet, Carlo, was quick to offer assistance with our luggage to and out of our room and to weigh them. There is a scale in the lobby to weigh your checked in luggage before you go to the airport which offers a convenience (price is 1 euro for 30 seconds. use of the scale. "Stay here if you need to be by the airport but otherwise dont bother"
Very ordinary airport hotel , rooms were clean and modern and the wifi worked. It's an odd layout where the reception, restaurant and rooms are all in different buildings. The restaurant had a decent menu but was closed by 21.30 so don't expect to be fed if you're staying here after coming in on a late flight. Breakfast in the morning was OK. There was no separate bar so after the restaurant closes its a bit soulless, although you could sit in the reception area and order a beer or glass of wine. "Surprising stay close to airport"
Like most people, we only stayed one night before flying out. Our room was somewhat dated and only of adequate size. When we first arrived, a plane arriving went right over the hotel and the noise in the room was extreme. The noise insulation is nowhere near adequate for an airport hotel. We asked whether there were any quieter rooms but they said they were all the same. We then checked the arrivals for the night and were disturbed to find there were several timetabled. However, we didn't hear anything after 11 pm. We're not sure whether they didn't arrive, used a different runway or we slept through them. The included breakfast was very good. At 24 Euro for a return shuttle for a couple, we thought that was fairly expensive when the hotel is only 3.5 km from the airport. However, we got a very good room rate so can't complain. Some of the pool facilities were closed for the hours that we were at the hotel. Very surprised of what a great hotel it is. The room was good and comfortable. No noise. The Restaurant was adjacent to the hotel. It had a bar and the food was good.. Service was top notch. The breakfast which was included in the room rate was the best.The food was fresh and hot. The choices were many. The coffee was good and american. Would highly recommend this airport hotel. The transfer service form airport to hotel and return was 6 Euro each way and you pay for at the hotel. "nice buffet breakfast, clean and comfortable room"
The room was clean and comfortable, if a little dingy. The hotel is very close to the airport and has a lot of shuttle times, including two before 7 am. (It does cost 6 euro each way, which seems a little expensive for such a short trip.) Considering the location, the hotel was quieter than I expected. The buffet breakfast was very nice, with lots of fresh food. I especially enjoyed the fresh fruit, croissants, and yogurt. The strength of the free wi-fi varied from fast and strong to slow and weak over the 18 hours I was there. I stayed here during a strike by Lufthansa, and the hotel staff didn't seem to want to know anything about customer issues with travel and cancelled flights. The ancient phone in my room was not working when I checked in, and the person at the receptionist desk did not seem to understand the urgency of this issue. I was travelling without a cell phone; maybe that's so rare these days she couldn't believe it, or maybe she did not fully understand my English. The call I did make cost about 10 euro. Shop around - while I was checking prices online the cost of the room varied a lot. I paid 100 euro (booked through the hotel's website) and overall found it a good value. I would stay there again. "One night stay between flights"
Nice place to stay when you have an early flight. Room and bathroom were a good size and clean. Breakfast was pretty good and staff was friendly. Because it's so close to the airport it's a bit noisy but nothing too bad. "Convenient for catching a flight"
Recent stayed the night at this hotel with a group of family members as we had an early flight the following day. The hotel is very conveniently located for a flight from Fiumicino, although disappointing that there is a charge for the airport shuttle. If you are driving the parking appeared ample. Rooms were small, but standard for European hotels in this star category. The hotel breakfast was excellent. Hotel staff were friendly and accommodating. Wifi was free and suitable. There is a bus stop a couple blocks away with service directly to Termini station for a small fee (6€). There is excessive jet noise as this hotel sits right under a runway, so if you are a light sleeper this is something to be aware of. We found this hotel to be reasonably priced, clean and a very good place to stay if you want to take some pressure off getting to the airport for an early flight the next day. It's attached Concorde restaurant was a very pleasant surprise for dinner. I had a connecting flight the next morning, so BEST WESTERN came in very handy due to it's proximity to the Fuimicini airport. At first, it was a bit tricky to find "bus shuttle" which was said to drive you from and to the airport, but after a while I realized that I had to make an arrangement. Since I arrived late, I decided to take a cab instead. A notice about that beforehand could be useful. A room quality of the hotel is pretty good. Mini bar was fully stacked and TV was up and running. However, I was not prepared (I didn't know) for a different electricity socket... guess I will have to think about that one too in the future. There were a few of universal sockets throughout the room which I found good enough. TV had some sort of hotel subscription which offered a variety of movies, shows and whatnot. I found it a bit weird that there was not anything for free - each movie costed around 8-10 euros. Bathroom was rather OK, stacked with basic hygienic stuff, which I found useful in particular since my luggage have stayed at the airport. One general remark I had, though I guess I cannot blame the hotel for it, was a temperature. The room was very cold and somewhat unpleasant. Pointing out that to a receptionist, I have found out that they had to turn the heating system off due to temperature fluctuations during the last few days. Indeed, as I have found, morning the next day was pretty warm. As for the departure, that was totally painless. The night I arrived, I saw the timetable for hotel shuttle which departed a bit earlier than I would have needed, but that was quite OK. The price for a shuttle was 8 EUR. The hotel was clean and the staff friendly and helpful. The rooms are quite small but do come with small balconies. There is quite a bit of noise from the airport when the planes take off. There is a gym on site. The restaurant is open late and is pretty good. "One night stay over between planes"
The only reason to stay here is the proximity to the airport. There is a shuttle service but unfortunately it doesn't operate for early morning or late night arrivals and departures. A taxi is about 15 euros (compared to 48 euros to/from the rome city center. We have stayed here several times due to the convenient location close to Fiumicino airport. Parking is available. Our room was clean and beds were comfortable. Basic commodities were offered including a generous breakfast buffet. Carpeting in room was tired and there was a stench of cigarette smoke in the room. We were exhausted when we checked in late evening, otherwise we would have asked for another room. The bathroom was impeccably clean, but very tight. We could not control room temperature and therefore we were uncomfortably warm until we opened the window-- beware however, of the aircraft noise! We were happy to book a hotel so close to the airport with the convenience of an airport shuttle that left every 20 minutes and a great breakfast service. The friendly staff checked us in quickly and were very accommodating when we asked about travel into Rome. Great hotel. Very clean, very nice and with all amenities. "Convient, Clean and Cheerful Stay before heading home and to Airport." Very clean and modern hotel located near airport. Near the Tiber River for a nice walk and some very nice restaurants. Very convenient for our last stop in Italy before heading home. Staff was very friendly and helpful. For only 6 euros - a shuttle ride to airport every 1/2 hour. "Price was right for our short stay, and our dinner at the restaurant was good"
We needed a hotel near the airport, and this one came through. Check in was easy. We were able to use their business computer center (free) to print out our next day boarding passes. Dinner at the on site restaurant was fine, and reasonably priced. The 5 am shuttle got us to our terminal in good time for 8 euros. We understand the breakfast that we missed would have been excellent. "Decent place to make airport connection"
I stayed at this hotel at the beginning and end of my trip to Rome. Good breakfast and room quite adequate with good WiFi. However, transfer to/from airport NOT good, and not complimentary. In fact, I saw a patron so dissatisfied with transfer service waiting so long at the airport, that a fist fight almost ensued when the driver refused to take customer to the hotel. This experience quite reduces the value of the hotel. "Modern hotel, easy access to airport"
Ultra modern styling in the rooms and lobby make this a winner. They have paid shuttle to the airport starting at 5 a.m. The rooms are larger than most in Italy and the building is well soundproofed, given that it is right at the southern end of runway 35. Hotel is very conveniently located a short distance away from the airport which made it great for an overnight stay. Room was decent size, clean and comfortable. Friendly staff, decent wifi which worked well and convinient shuttle bus which stops right outside hotel. This is a good hotel for a stopover. Good selection of cafes and restaurants in the vicinity and even though hotel under flight path there is not much noise from the aircrafts at all. Would suggest to make it clearer where exactly shuttle bus leaves from at airport. After late flight last thing wanted to do was search for a coach and walk around a quiet airport. Hotel is conveniently located only a few minutes from the Airport. Breakfast buffet was very good, lots of choice and the staff were professional and courteous. Room we had, for three, was rather small, and had an overwhelming cigarette smell, although it was a no smoking room. It may be that the odor had penetrated the carpets in the room, but it was definitely noticeable. Found it difficult to adjust the temperature in the room as well. "Commuter Hotel Necessary but Disappointed"
Yes, it's convenient to FCO, but its 1960s decor, room sizes and dirty carpeting call for a lower value than I have assigned. Staff helpfulness, sleep quality and the size of the breakfast buffet raise my rating to average. "wrong information - hard beds"
We booked this hotel back in April for an October 2nd stay before returning home. It is a convenient location but there were several drawbacks. They do have a shuttle service to and from the airport but it is not free of charge. That charge is not clear from their website. About five days before our arrival we got an very nice email welcoming us and giving us the location to pick up the shuttle at the airport. Problem was the information we not up to date in the email and we waited about 45 minutes and missed a bus before some nice person told us the correct parking slot for the hotel bus. If the wrong info was sent in April I could understand that but it was sent five days before our arrival. When I informed the clerk at the hotel she seemed to have a hard time believing me and I showed her the email. No apologies were forthcoming. The hotel is well located and the facility is clean. Biggest problem after actually arriving was that the bedding is just not comfortable. Beds and pillows super hard. We had a fair amount of hard mattresses in Italy but most had some kind of topper or cushion on them which resulted in them being very comfortable. No toppers on these beds. I would not stay with them again. "A Solid Bargain for near-airport overnight"
I researched this hotel using Trip Advisor and studied many of the reviews. They turned out be quite accurate and I was not disappointed. First, the negative points. Although a shuttle bus is advertised, incredibly it does not operate between 10:30 a.m. and 4 pm! This means taking a 15-minute cab ride from the airport. As cautioned by other travellers, I took the advice to NOT take the cabs right outside the terminal. These are all downtown Rome cabs and their prices might be double that of the local taxis. However, the problem is finding a local cab. This means crossing a footbridge over to the train station where the local cabs are parked. Actually finding them is a challenge and even station staff weren't quite sure how I would find them. Be patient and seek them out as it will avoid being ripped off by the pushy cab drivers who will swarm you on arrival in the airport concourse. Once I reached the hotel (about 15-20 Euros cab fare) just after noon, the welcome was warm and friendly. Although check-in is normally after 3pm, the staff accommodated me immediately, which was much appreciated after an overnight flight from Canada. I was housed in the older wing but the room was clean and comfortable. No view - after all, this is an industrial airport area - but all I needed was a meal and good night's rest before leaving next day for Sardinia. Following a recommendation from another reviewer, I walked around the corner for dinner at a nearby restaurant. It was just so-so but gave me a pleasant short walk outside the hotel. I should have remained at the Best Western. The dinner service there appeared busy and the restaurant looked clean and modern. The next morning, my included breakfast was at that location and I promised the host, Signor Perrino, I would mention him for his warm welcome. I was travelling solo but got the best of attention. The breakfast buffet offers an amazing variety of hot and cold choices and the pastries were superb. I had such a good breakfast that there was little room for more. However, Signor Perrino insisted that I sample a fresh baked pastry just prepared by his wife. It made me wish I had stayed there for dinner the previous night. Departure was around noon, so again, no shuttle. The staff called me a cab and it seemed I paid a little more for the return trip to the airport. Overall, the prices were reasonable and good value for money. I would have no hesitation staying there again if a stop between flights is needed and I would recommend this hotel for anyone seeking value for money and pleasant service. Beautiful, clean place!!! And Amro was extremely helpful for us as travelers from the USA!!!!! The pool was great and the food wonderful. We walked to the Sea and enjoyed an unexpected day on the water!!! Very nice place with very polite employees Is highly recommend!!!! !